Librarians and Wikipedia: an Ideal Match? How might these skills and traits relate to Wikipedia? Wikipedia is an encyclopedia: Wikipedia is not, for example, a soapbox, an advertising platform, a vanity press, an indiscriminate collection of information, or a web directory. Wikipedia is written from a neutral point of view: Wikipedia strives for articles that document and explain the major points of view, giving due weight with respect to their prominence in an impartial tone. It avoids advocacy and we characterize information and issues rather than debate them. Wikipedia is free content that anyone can use, edit, and distribute: Since all editors freely licence their work to the public, no editor owns an article and any contributions can and will be freely edited and redistributed. Editors should treat each other with respect and civility: Contributors are expected to respect fellow Wikipedians, even when you disagree. Apply Wikipedia etiquette, and don’t engage in personal attacks. Wikipedia has no firm rules: Wikipedia has policies and guidelines, but they are not carved in stone; their content and interpretation can evolve over time. Their principles and spirit matter more than their literal wording, and sometimes improving Wikipedia requires making an exception. How well do the characteristics of librarians relate to Wikipedia’s goals and principles? How Well Are The Two Communities Aligned? The following table suggests how these characteristics of librarians relate to Wikipedia’s goals and principles and other information about Wikipedia. 1 A love of knowledge and learning Aligned with Wikipedia’s goal of “a world in which every single person on the planet is given free access to the sum of all human knowledge“. 4 Broad overall knowledge of life and the world Wikipedia provides access to broad knowledge of life and the world. In addition Wikipedia provides an environment in which librarians can share their knowledge and support their users who may also wish to share their knowledge. 5 Strong organizational skills There are currently 4,616,531 articles in the English-language version of Wikipedia. In order to help manage such a large number of articles there will be a need to have good organisation skills (e.g. in making use of metadata such as Wikipedia categories) to help manage the service. 6 Good with numbers As described in a post on Analytics Events: For Learning and For Research, the 1:AM conference Wikipedia provides a wide range of metrics, which may be of relevance to those with interests in altmetrics. 10 Basic affinity for working with large volumes of information This is of direct relevance to Wikipedia. 11 Computer skills This is of direct relevance to Wikipedia. Perhaps the librarian trait which does not initially appear to be aligned with interests in Wikipedia is a love of books. However the Wikibooks service which, along with Wikipedia, is hosted by the Wikimedia Foundation does provide access to an open-content collection of text books that anyone can edit which currently hosts 2,722 books with 49,758 pages. In addition librarians with a love of books may well find that the Wikipedia summary of lists of books that have articles on Wikipedia, organised by various criteria may provide a useful starting point for sharing their expertise! Of course the library traits of friendliness and being personable will traditionally have been relevant to the real world environment and visitors to the physical library. Nowadays if would be appropriate to relate these traits to the online environment, just as they would also apply to engagement with patrons on the telephone. Librarians and Wikipedia: an Ideal Match! I would argue that there are a number of other important key characteristics shared by dedicated professional librarians who are comfortable working in today’s online environment which are relevant to an environment in which Wikipedia provide a resource which is widely used. In a talk on “Wikipedia in the library – the elephant in the (reading) room?” given at the LILAC 2014 conference Nancy Graham and Andrew Gray pointed out the flaws in the view that: “We have a problem. The kids these days are reading too many encyclopedias“. As can be seen from their slides they argued that considerations of the relevance of Wikipedia in education provides an ideal teaching moment for thinking critically about online material, differentiating the good from the bad and even engaging with the means of production. Beyond digital literacy, librarians are also perceived as belonging to a trusted profession. Although expertise in use of online tools is now essential for librarians, not all online tools will necessarily respect users’ privacy concerns – indeed as Phil Bradley recently pointed out Google is tracking your every move. Other popular online services, such as Facebook, LinkedIn, etc. will also track your online activities and display ads based on the resources you visit. Although such tools will be used by librarians, they will find that Wikipedia provides a more ethical online environment, with visitors to the Web site not having to worry out intrusive adverts or their browsing patterns and online profile being sold to advertisers. Librarians and Wikipedia: surely an ideal match! Wouldn’t you agree? If you do agree I’d be interested to hear how you are using Wikipedia in your library. If, however, you don’t agree feel free to give your reasons why you feel librarians should not actively engage with Wikipedia. Brian Kelly is the Innovation Advocate at Cetis, University of Bolton. He has responsibilities for promoting use of innovative technologies and practices in higher and further education. 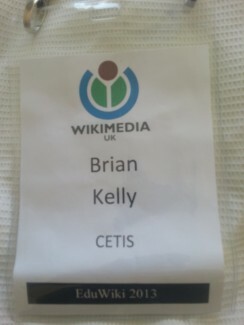 Brian has given talks on the importance of Wikipedia for librarians including “Editing Wikipedia: Why You Should and How You Can Support Your Users” at the CILIP Wales 2014 conference and “Why and How Librarians Should Engage With Wikipedia” at the CILIPS Autumn Gathering 2014. Brian has also written a number of blog posts about Wikipedia including Top Wikipedia Tips for Librarians: Why You Should Contribute and How You Can Support Your Users and Wikipedia, Librarians and CILIP. 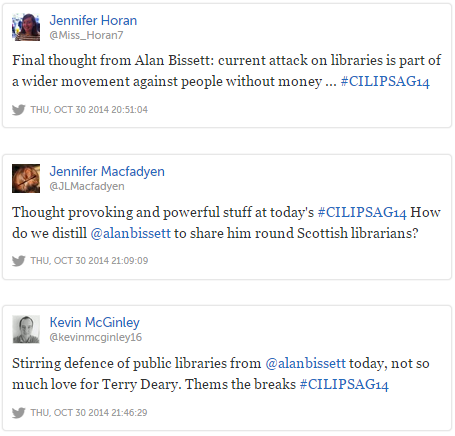 This post was submitted to the CILIP Blogger Challenge, a competition which provides bloggers the opportunity to talk about important library, knowledge and information issues. Posts must be between 500-1,500 words long and must be submitted by Friday 7 November. Submissions will be judged on the following criteria: 1) be short and focussed on one issue; 2) have a short, meaningful and descriptive title; 3) be relevant; 4) be bold and encourage debates; 5) be original and 6) make complex concepts and ideas accessible to non-experts. However since criteria 5 requires that submissions be original (i.e. “should provide a new and original perspective and should not have been published anywhere else previously, including on your own blog”) this post is being published after the CILIP Blogger Competition judges have selected the winning blog posts. As described in a post entitled Analytics Events: For Learning and For Research, the 1:AM conference, the first dedicated altmetrics conference took place in London last week. This was a fascinating conference, with lively discussion taking place at the conference and on the #1amconf Twitter back channel. The conference embraced event amplification technologies, with a number of remote speakers giving their talks using Google Hangouts and all of the plenary talks being live-streamed and made available on the conference’s YouTube channel. With so much discussion taking place across a range of channels I created a Lanyrd entry for the conference and publicised it on the final day of the conference. I’m pleased to say that many of the participants and event organisers used the Lanyrd page to provide access to the various reports on the sessions, access to slides used by the speakers and video recordings of the talks, photos of the event and archives of the discussions and arguments which took place on Twitter: at the time of writing links have been added to 35 separate resources. 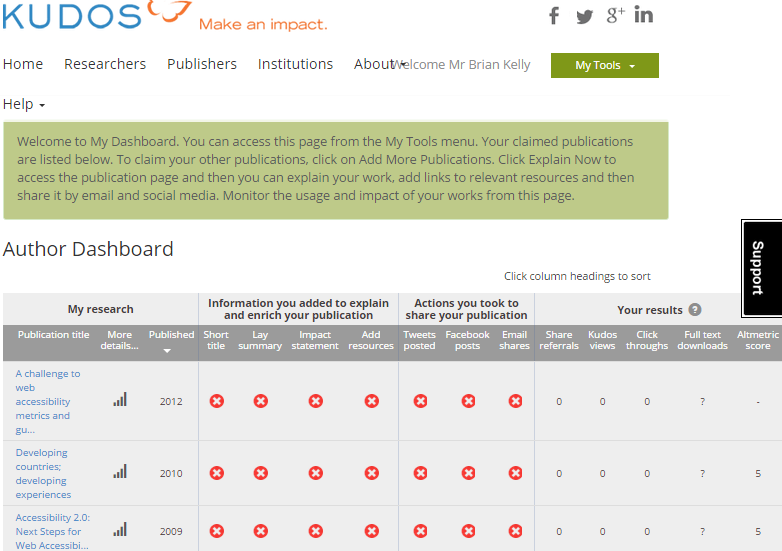 Altmetrics as an Indicator of Quality or of Interest? Hi David. Thanks for writing the post! I founded Altmetric.com. I think you and Andrew have some fair points, but wanted to clear up the odd bit of confusion. I think your underlying point about metrics is fair enough (I am happy to disagree quietly!). You’re conflating metrics, altmetrics and attention though. Before anything else, to be absolutely, completely clear: I don’t believe that you can tell the quality of a paper from numbers (or tweets). The best way to determine the quality of a paper is to read it. I also happen to agree about post publication review and that too much hype harms science. Euan concluded his comment by providing a link to his post which suggested that those with interests in the impact of scientific research to Broaden your horizons: impact doesn’t need to be all about academic citations. The consensus at the conference seemed to be that the view (perhaps based on misunderstandings) that altmetrics would provide an alternative to citation analysis to determine the quality of research and should determine how research should be funding is no longer widely accepted; instead altmetrics are regarded as being complementary to citation data and can provide a broader picture, especially of how research is being discussed and debated. In discussions with other participants I heard how the view that researchers (and funders of research) had responsibilities for raising the visibility of their research is becoming accepted: the view that only one’s peers need be interested in the research was felt to be no longer relevant. “We need to be seen to be able to justify funding for research“was one comment I heard. Scientists may feel uncomfortable about marketing their work, but we all are doing it already. We know that giving a presentation at a key meeting can be a boost for our career, and we know about the importance of maintaining an academic homepage listing our research interests and publications. And people reading this blog will understand that a science blog can be a powerful marketing tool. But if researchers are now accepted the need to raise the visibility of their research, the question then is what tools can they use to support this goal? The session on Altmetrics in the last year and what’s on the roadmap provided brief summaries about altmetrics application including talks about Altmetric, Plum Analytics, Impactstory, PLOS, Mendeley, Open Access Scholarly Publishing Association and Kudos. Kudos is a new service designed to help scholars and their institutions increase the impact of their published research articles. Altmetric tracks and collates mentions of research articles on social media, blogs, news outlets and other online sources. This integration means mentions are now incorporated on the Kudos metrics pages for individual authors, and accompanied by a short summary which further details the number of mentions per source. Each article is assigned a score based on the amount of attention it has received to date, and authors are able to click through to see a sample of the original mentions of their article. I have created an account on Kudos. I was able to quickly claim many of my research papers. As can be seen from the screenshot of the dashboard a number of my papers already have an Altmetric score, which is defined as “a reflection of the amount of interest your publication has attracted across news outlets and social media“. Explain: Explain your work and tell readers what it’s about and why it’s important. Enrich: Enrich your publication by adding links to related materials. Share: Share a link to your publication by email and social media. Measure: Measure the impact on your publication performance. In a recent post entitled Wikimedia and Metrics: A Poster for the 1:AM Altmetrics Conference I described the metrics for Wikipedia articles which may provide indications of the effectiveness of the outreach of the article. The post summarised a poster which was displayed at the conference and which is shown in this post. As may be shown by usage metrics, Wikipedia can provide a mechanism for raising the visibility of topics described in Wikipedia articles, which can include articles based on research work. It would appear that Kudos and Wikipedia both provide mechanisms for enhancing interest in research work. But these two tools provide contrasting approaches to the way they support such dissemination work. With Kudos, authors of research papers are expected to provide summaries of their work. by (a) adding a short title to the publication to help make it easier to find and can help increase citations; (b) adding a simple, non-technical explanation of your publication will make it easier to find, and more accessible to a broader audience and (c) adding an explanation of what is most unique and/or timely about your work, and the difference it might make, will help increase readership. Wikipedia is an encyclopedia: It combines many features of general and specialized encyclopedias, almanacs, and gazetteers. Wikipedia is not a soapbox, an advertising platform, a vanity press, an experiment in anarchy or democracy, an indiscriminate collection of information, or a web directory. Wikipedia is written from a neutral point of view: We strive for articles that document and explain the major points of view, giving due weight with respect to their prominence in an impartial tone. We avoid advocacy and we characterize information and issues rather than debate them. Wikipedia is free content that anyone can use, edit, and distribute: Since all editors freely license their work to the public, no editor owns an article and any contributions can and will be mercilessly edited and redistributed. Respect copyright laws, and never plagiarize from sources. Editors should treat each other with respect and civility: Respect your fellow Wikipedians, even when you disagree. Apply Wikipedia etiquette, and don’t engage in personal attacks. Seek consensus, avoid edit wars, and never disrupt Wikipedia to illustrate a point. The second of these principles, which expects Wikipedia articles to be written from a neutral point of view, will be the most challenging for researchers who would like to use Wikipedia to raise the visibility of their research to a wider audience. One of three core content policies for Wikipedia articles is that, content should be provided from a neutral point of view – and it will be difficult to do this if you wish to publish or cite content based on one’s own research. Another challenge for researchers is a second core content policy which states that Wikipedia articles must not contain original research. Perhaps a simple approach which could be made by open researchers who are willing to share their experiences openly would be ensure that initial desktop research which typically may be used as a literature review is used to support existing articles. However the bigger challenge is to address the tensions between the funders’ requirement to ensure that research they fund is widely disseminated and exploited by others and Wikipedia’s requirement for neutrality. In a recent post on Links From Wikipedia to Russell Group University Repositories I highlighted similar challenges for universities which may be tempted to seek to exploit the SEO benefits which links from Wikipedia to institutional web pages may provide. Might research councils and other funders of research find it useful to embrace similar principles? And is there a role for research librarians and others with responsibilities for supporting members of the research community in developing similar guidelines which will help ensure that researchers make use of Wikipedia in a way which supports the Wikipedia principles which have helped to ensure that the encyclopedia is regarded as a valuable source of information? 1:AM – time for an altmetrics conference! 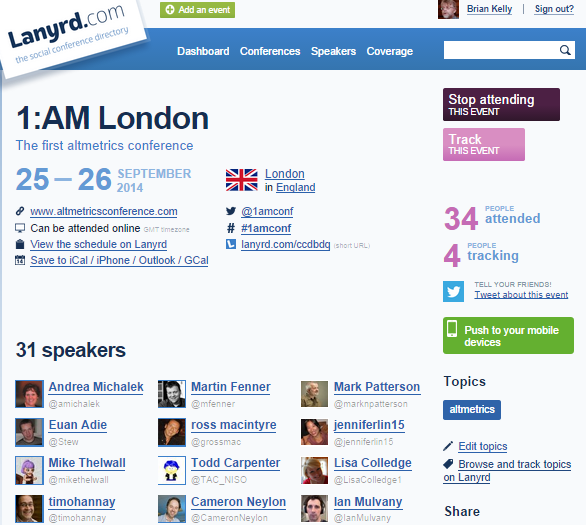 The 1:AM Altmetrics conference is being held in London today and tomorrow, 25-26th September. We will be taking a closer look at how authors, readers, funders, publishers and institutions are beginning to integrate altmetrics into their scholarly communication processes — and the challenges that they face along the way. With a quick overview of recent developments and future plans, we will aim to better understand how and why altmetrics can be of use to the community — and draw further inspiration from those outside academia. The conference programme is packed with interesting talks and workshop sessions running from 9am to 5/5.30 pm on both days. It is not surprising that the conference was fully booked shortly after the conference was announced. I will be attending the conference and will present a poster designed by myself and Martin Poulter on behalf of Wikimedia UK. 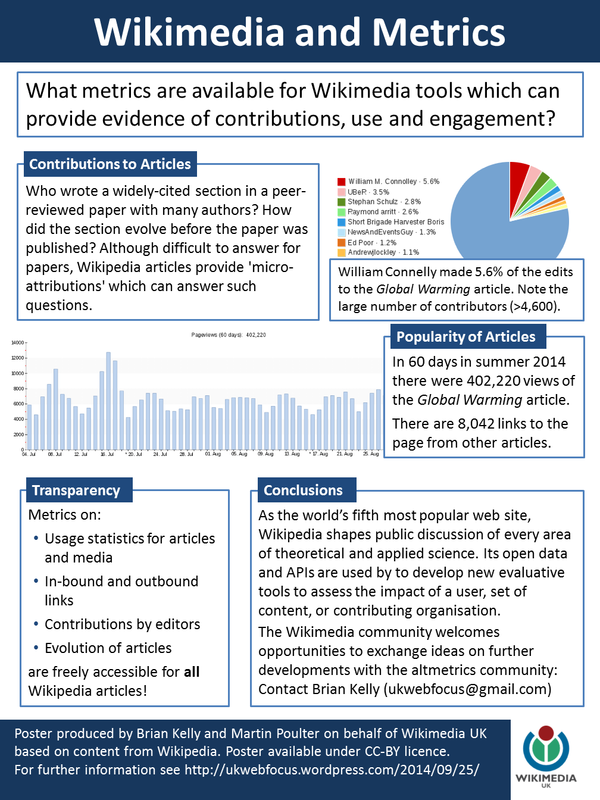 The poster (which is shown and is also available on Scribd) summarises metrics which are available for Wikipedia articles, including usage statistics for articles and media, information on both in-bound and outbound links to and from Wikipedia articles, statistics on the contributions made by editors of Wikipedia articles and statistics on the evolution of articles. If you are familiar with Wikipedia metrics, if you visit a Wikipedia article you will notice a “View history” button near the top of the window, as shown below for the Global warming article. The first edit was made on 30 October 2001. The latest edit was made 4 days ago. There have been 4,776 minor edits, 3,307 anonymous edits (identified by an IP address) and 200 edits made by bots (automated edits). 527 links in-bound links to the article. 1,712 watchers (who receive notification of changes to the article). Over 406,000 views of the article over the past 60 days. As the world’s fifth most popular web site, Wikipedia shapes public discussion of every area of theoretical and applied science. Its open data and APIs are used by to develop new evaluative tools to assess the impact of a user, set of content, or contributing organisation. The Wikimedia community welcomes opportunities to exchange ideas on further developments with the altmetrics community. Feel free to leave any comments, questions or observations on this blog post. This discussion focuses on how Wikipedia could become the entry or discovery point to all significant research for the general public, and for scholars who are working just outside of the topic of interest. For most people, even researchers from closely related areas, summaries and explanations of a piece of research can be a crucial means both to discover and to begin to get into a new piece of research. Currently overviews of research topics are supported through two mechanisms: reviews and “front matter” content. A review is a systematic summary of a field, written by an expert. These go out of date quickly, particularly in rapidly moving areas of research. Front matter is “News and Views” pieces, often found at the “front” of scientific journals that explain newly published research and put it in context. This often includes a discussion of explaining how the research is an important advance and its broader societal implications. Both of these functions could easily be provided in a more up to date and scalable manner by tapping into a global community of experts. Wikipedia articles are often the top web search result for initial queries in many research areas and these articles are a major source of traffic for scientific journals. As the first port of call for many users of research and a significant discovery route the potential for Wikipedia as a form of dynamic, expertly curated “front matter” for the whole research literature is substantial. This facilitated discussion session will focus on how this role could be enhanced, what is currently missing and what risks exist in taking this route. Reading this I wondered about the extent to which Wikipedia articles currently link to papers hosted in institutional repositories. In order to explore this question I made use of Wikipedia’s External links search tool to monitor the number of links to from Wikipedia pages from to institutional repositories provided by the Russell Group universities. The survey was carried out on 28 August 2014 using the service. Note that the current finding can be obtained by following the link in the final column. Repository used: The University of Sheffield also uses the White Rose repository which is also used by Leeds and York. See the Leeds entry for the statistics. Repository used: The University of York uses the White Rose repository which is also used by Leeds and Sheffield. See the Leeds entry for the statistics. The URL of the repositories is taken from the OpenDOAR service. Since the universities of Leeds, Sheffield and York share a repository the figures are provided in the entry for Leeds. A number of institutions appear to host more than one research repository. In such cases the repository which appears to be the main research repository for the institution is used. It should be noted that this initial survey does note pretend to provide an answer to the question “How many research papers hosted by institutional repositories provided by Russell group universities are cited in Wikipedia articles?” Rather the survey reflects the use of this blog as an ‘open notebook’ in which the initial steps in gathering evidence are documented openly in order to solicit feedback on the methodology. This post also documents flaws and limitations in the methodology in order that others who may wish to use similar approaches are aware of the limitations. Possible ways in which such limitations can be addressed are given and feedback is welcomed. In particular it should be noted that the search engine used in the survey covers all public pages on the Wikipedia web site and not just Wikipedia articles. It includes Talk pages and user profile pages. In addition the repository web sites include a variety of resources and not just research papers; for example it was observed that some user profile pages for researchers provide links to their profile on their institutional repository. It was also noticed that some of the files linked to from Wikipedia were listed in the search results as PDFs. Since it seems likely that PDFs referenced on Wikipedia which are hosted on institutional repositories will be research papers a more accurate reflection on the number of research papers which are cited in institutional repositories may be obtained by filtering the findings to include only PDF results. In addition if the findings from the search tool were restricted to Wikimedia articles only (and omitted Talk pages, user profile pages, etc.) we should get a better understanding of the extent to which Wikipedia is being used as the “front matter” to research hosted in Russell group university institutional repositories. If any Wikipedia developers would be interested in talking up this challenge, this could help to provide a more meaningful benchmark which could be useful in monitoring trends. There are risks when gathering such data that observers with vested interests will seek to make too much of the findings if they suggest a league table, particularly if there seem to be runaway leaders. However as can be seen from the accompanying pie chart in this case no single institutional repository has more than 17% of the total number of links (and remember that these figures are flawed due to the reasons summarised above). However there will be interesting policy implications if universities agree with the suggestion that Wikipedia can act as “the front matter to all research”, especially if links from Wikipedia to the institution’s repository results in increased traffic to the repository. Another way of characterising the proposal would be to suggest that Wikipedia can act as “the marketing tool to an institution’s research outputs”. Earlier today I came across an article entitled “So who’s editing the SNHU Wikipedia page?” which described how analysis of editing patterns and deviations from the norm may be indicative of inappropriate Wikipedia editing strategies, such as pay-for updates to institutional Wikipedia articles. Our firms believe that it is in the best interest of our industry, and Wikipedia users at large, that Wikipedia fulfill its mission of developing an accurate and objective online encyclopedia. Therefore, it is wise for communications professionals to follow Wikipedia policies as part of ethical engagement practices. If we wish to see Wikipedia acting as the front matter to research provided by the university sector should we be seeking to develop a similar statement on how we will do this whilst ensuring that we act in accordance with Wikipedia’s policies and guidelines? Of course the challenge would then be to identify what the appropriate best practices should be. Wikipedia is important for librarians. 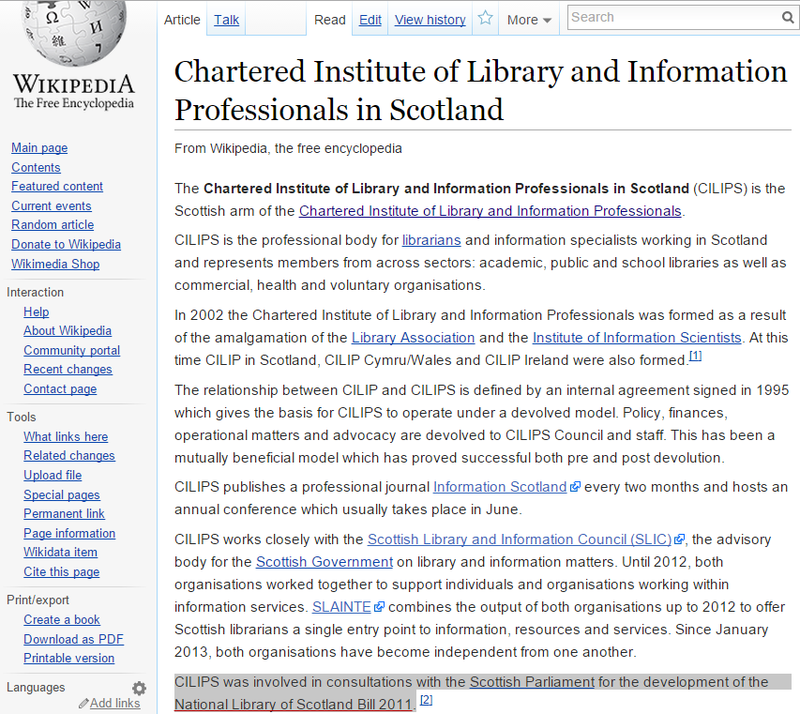 A month ago in a post entitled Wikipedia and Information Literacy Article in CILIP Update I reported on an article published in CILIP Update about the role Wikipedia can play in information literacy. At the time the article was only available to CILIP members. However after a short embargo period I’m pleased to announce that a copy of the article is now freely available on Google Docs. 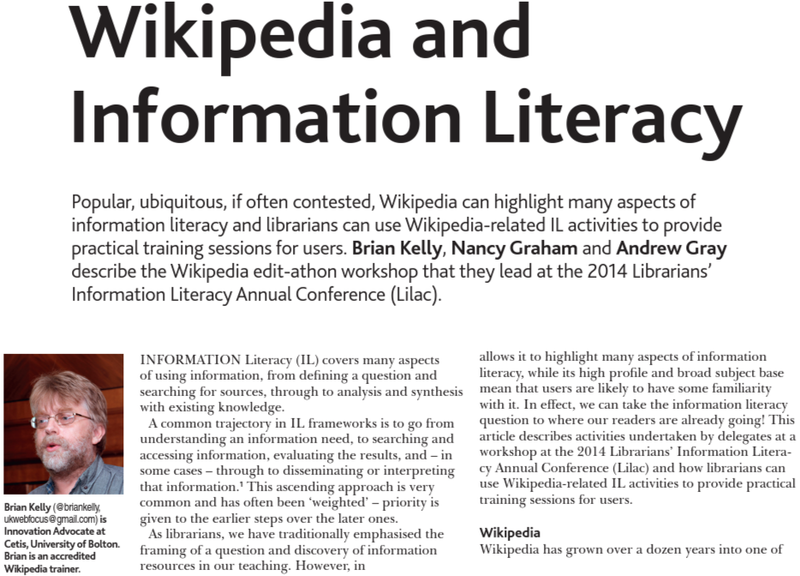 Popular, ubiquitous, if often contested, Wikipedia can highlight many aspects of information literacy and librarians can use Wikipedia-related IL activities to provide practical training sessions for users. Theoretically and strategically, Libraries and Wikipedia are natural allies. This relationship directly impacts our core activity of research and editing. Libraries are the ‘source of sources’, and Wikipedia is only as good as its sources. Meanwhile, Wikipedia has the viewership that libraries crave to bring people to their doors to do deeper research. By connecting Libraries and Wikipedia we can complete a virtuous circle of research and dissemination. In addition to the sessions on Wikipedia I facilitated at the LILAC 2014 conference over the past year I have given several talks about Wikipedia including an invited plenary talk on “Editing Wikipedia: Why You Should and How You Can Support Your Users” at the CILIP Wales 2014 conference – a talk which was complemented by a blog post which provided Top Wikipedia Tips for Librarians: Why You Should Contribute and How You Can Support Your Users. I also suggested that those who had a interest in and a desire to make updates to Wikipedia articles they could do so during my talk. I pointed out that, as shown, the CILIP article in Wikipedia included slightly dated membership details from 2012 which could usefully be updated. However I pointed out the Wikipedia neutral point of view (NPOV) principle which means “representing fairly, proportionately, and, as far as possible, without bias, all of the significant views that have been published by reliable sources on a topic“. One way of minimising risks of sub-conscious biases in articles is to ensure that content is provided by those who do not have direct involvement with the subject area of an article. For an article about an organisation it would therefore be appropriate for an article about CILIP should be updated by editors who are not employed by the organisation. The problem I have is with the statement about CILIP membership being at its lowest … the person stating this has selected the year 2010 as the benchmark. Why? Why not 2007 or 2004? 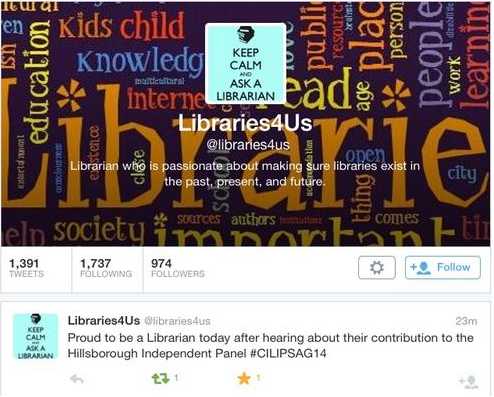 Why not take the year that CILIP was last the LA and use those figures? Following a recent Twitter discussion about CILIP membership numbers that CILIP Wikipedia article was updated: the article now states that “CILIP has 13,470 members as of May 2014” and cites the CILIP “Financial and membership report 8th July 2014” report (PDF format) as the source of this figure. However although this information comes from a reliable source and was added by a Wikipedia contributor who is not employed by CILIP this information by itself does not address the suggestion made by Barbara Band that there is a need for membership numbers since CILIP was founded (in 2002) in order to be able to have an informed discussion on trends in membership numbers. I was told by a member of CILIP that information on membership numbers is available on the CILIP web site but is not easy to find. The information can be found in the Annual reports and accounts (note since the reports are in PDF format the information cannot be found using the CILIP web site’s search facility). The “Year end 2013 Financial report item 13 March 2014″ (PDF format) provides, in Appendix D, the CILIP Membership Statistics as at 28th February 2014. 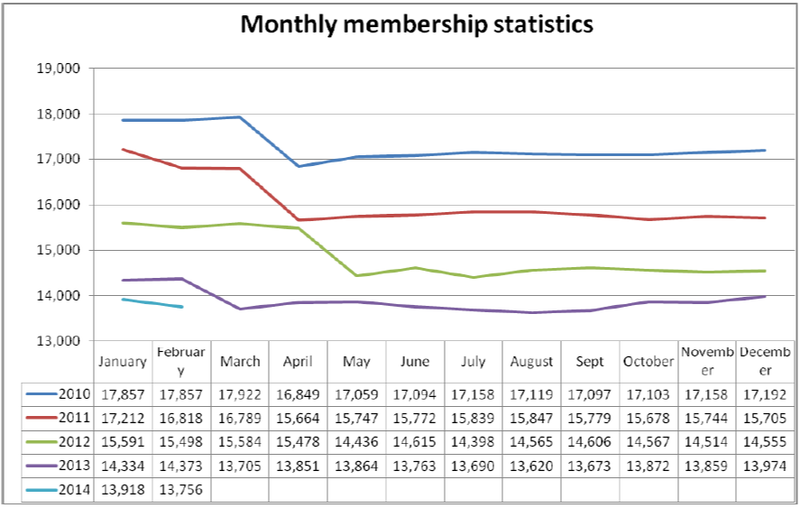 The appendix includes details of the monthly membership numbers from January 2010 to February 2014. A graph of the membership numbers, taken from the report, is shown. Looking at the year on year graph of membership figure, 2014 continues to reflect positive trends compared with previous years, but this will become more realistic as the year progresses. I would interpret the graph as indicating a sharp decrease in membership numbers in spring (possibly when annual subscriptions must be paid) with a much smaller increase in numbers over the rest of the year, perhaps when new members join. An intriguing question for an information profession might be “How would you find the membership numbers of an organisation which has been in existence since 2002?” My initial attempt at using annual reports on, in this case CILIP’s Web site only provided relevant information for since 2010 – I understand that the CILIP web site may have been relaunched around this time, with old content lost. My next attempt was therefore to use the Internet Archive. I found an archived copy of the Annual Report captured on 5 December 2008 which contained links to annual reports for 2005, 2006 and 2007. However the reports themselves (which were in PDF format) were not captured :-) However from the Internet Archive I managed to find an archived copy of the CILIP Membership page captured on 2 December 2002 which stated “CILIP is the professional Membership body of choice for around 23,000 Members“. Although this isn’t an authoritative figure it does provide an indication of the size of the organisation around the time it was established. If CILIP members, consumers, e-subscribers and stakeholders are taken together, then the CILIP community encompasses over 40,000 people who give their support to CILIP. My final attempt at finding this information isn’t based on using an advanced search engine. Rather I’m seeking to make use of the ‘wisdom of the crowds’. 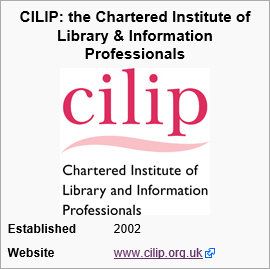 If you’re reading this blog post and you were a member of CILIP between 2002 and 2010 perhaps you may still have copies of official CILIP papers which may contain information on CILIP membership figures during this period. If so, I would invite you to share this information, either as a comment on this post or, preferably, by updating the CILIP article on Wikipedia or the CILIP article’s Talk page. Use of the Talk page would be particularly appropriate if you are new to Wikipedia and are unsure as to the processes for updating content and ensuring that content is provided from a neutral point of view. As its name suggests the Talk page, which every Wikipedia article has, can be used for discussions about the Wikipedia article. 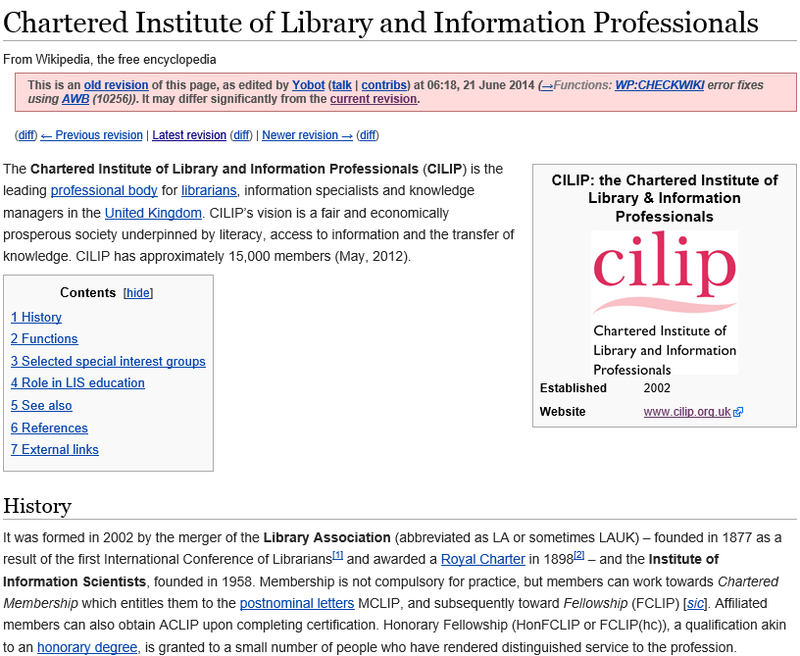 In addition to the thoughts I have added on finding sources for CILIP membership numbers, I have also added a section on “Additional Information for the CILIP Wikipedia Article” which invited suggestions for further developments to the page. In addition to including further textual information and images to the article another development to the article could be further factual information provided to the article’s ‘info box’. As illustrated this currently contains the name and abbreviation of the organisation, its logo, foundation date and URL for the CILIP web site. Looking at the American Library Association Wikipedia article for ideas, perhaps additional information such as location (London), region covered (UK), budget, numbers of staff and names of the president and other senior figures could also be provided. It should be noted that, unlike the content provided in the main body of Wikipedia articles, the information provided in info boxes is harvested by the DBpedia service and made available as Linked Data which enables structured queries to be carried out on the information. Librarians and information professionals, in particular, will appreciate the benefits to be gained from carrying out structured queries! It can be useful to pro-actively ensure that the content of your web site is archived by a service such as the UK Web Archive prior to any Web site redevelopment work. Important information can be hidden in PDF files. Although PDF is an open standard and is suitable for archival purposes, the Web-based archiving infrastructure works better with Web-native file formats (i.e. HTML). In addition content held in PDF files may be hidden from search engines. So although finding the information is proving difficult, the exercise has been useful in identifying some best practices for web site management which I hadn’t previously considered. In addition I have discovered the value of the Internet Archive and the UK Web Archive in ding content which has vanished from live web sites. Finally, I hope that trusting the ‘wisdom of the crowds’ will help in finding the missing information and being able to respond to Barbara Band’s request that we “take the year that CILIP was last the LA and use those figures?“. Over to you! The current issue of CILIP Update (access restricted to CILIP members and subscribers) features a two-page article entitled “Wikipedia and Information Literacy“. The article, which was written by myself, Nancy Graham and Andrew Gray is based on the Wikipedia workshop sessions and talks which we gave at the LILAC 2014 conference in Sheffield in April 2014. It is a good idea to consider use of resources and methods which are: a) already in widespread use; b) with which readers already have a positive relationship; and c) which can be used to demonstrate multiple aspects of information literacy within a single context. One such resource is the ubiquitous and popular – if often contested – Wikipedia. The ways in which Wikipedia is constructed and operates allows it to highlight many aspects of information literacy, while its high profile and broad subject base mean that users are likely to have some familiarity with it. In effect, we can take the information literacy question to where our readers are already going! The sessions we facilitated at the LILAC 2014 conference began with a presentation by Nancy and Andrew on “Wikipedia: it’s not the evil elephant in the library reading room” (see the slides on Slideshare which are embedded at the bottom of this post). We then facilitated two workshops sessions: a practical session in which participants could signup for a Wikipedia account and familiarise themelevs with basic Wikipedia markup and the Wikipedia culture followed by an edit-a-thon in which participants looked at ways in which the existing Information Literacy Wikipedia article could be updated. Rather than updating the existing Information Literacy article we decided to create a new page which addresses information literacy from a UK perspective. The fledgling page is available but, as can be seen, this is a work in progress. We urge librarians with an interest in information literacy to sign up to Wikipedia and contribute to this section. The slides on Wikipedia: it’s not the evil elephant in the library reading room are available on Slideshare and embedded below. The “Traditional Lecture must DIE” argued Phil Root in a (err) TEDx lecture in September 2012. In the video he cited research which suggested that students learning is more effective when active engagement techniques are provided (5 minutes into the video). 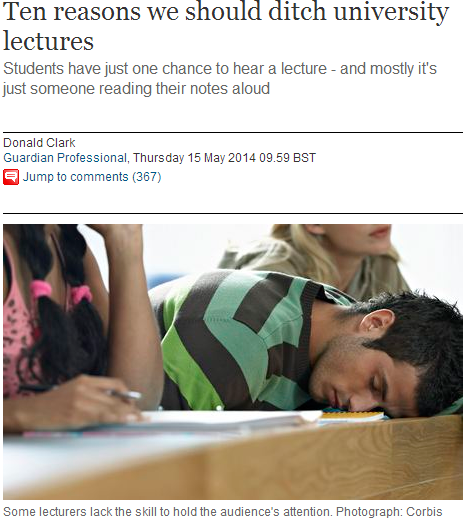 Last Thursday an article in the Guardian’s Higher Education Network gave “Ten reasons we should ditch university lectures“. Currently there have been 367 comments made to this article. If you have an interest in the relevance of lectures in teaching you may wish to contribute to the discussions. However my interest is in the effectiveness of plenary talks at conferences. A question I’d like to address is “Can we make use of interactive techniques in large-scale lecture theatres?” including conferences used for professional development. At the UKSG 2013 conference I recall a plenary talk by Laurel Haak on ORCID: Connecting research and researchers. As flagged at the very start of the video recording of the talk Laurel invited those who had a mobile computer with them to register for an ORCID ID during the talk. “Here is the challenge to you” Laurel said 2 minutes 50 second into her talk “Anyone who has a computer and you don’t already have an ORCID identifier please take about 30 seconds to register for one“. I have used this approach myself when talking about researcher IDs. 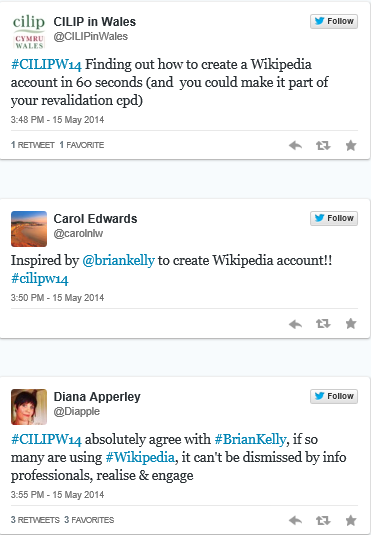 Last week I spoke at the CILIP Wales 2014 conference and used this approach again, but this time to encourage participants to sign up for a Wikipedia account. I had announced that the talk would provide an opportunity for a CPD activity – I was pleased to be able to see evidence that this activity was successfully completed by at least one conference delegate. Although I had planned the Wikipedia user registration activity, the inspirational opening talk made me wonder how I could adapt my presentation to relate to such political considerations. The theme of the CILIP Wales 2014 conference was “Making a difference: libraries and their communities“. In my presentation I argued that librarians who supported their users in use of Wikipedia, which included creating and updating Wikipedia articles would be a way of engaging with communities in an effective way in light of the popularity of Wikipedia. A show of hands confirmed that Wikipedia was not only popular with the users: the vast majority of the audience made use of Wikipedia with only one (brave!) lady admitting that she had never visited Wikipedia. But how might we gather evidence of use of Wikipedia by librarians, which might be used as evidence of how librarians are engaging in a rapidly changing information environment? In my presentation I suggested that after spending about 60 seconds in creating a Wikipedia account the next step should be to create a Wikipedia profile page and I gave examples of a simple profile and a slightly more advanced profile which might provide inspiration for a profile page for new Wikipedia editors. we would have significant evidence of take-up in Wikipedia in Wales. I have given a number of Wikipedia sessions for those who wish to know more about editing Wikipedia. However such sessions are likely to attract only those who are already convinced of the value of Wikipedia. Of more importance, I feel, is being able to persuade sceptics or those who have not previously considered getting a Wikipedia account and updating Wikipedia articles or the reasons why updating Wikipedia articles is of particular relevance to information professionals and then to convert that moment of inspiration into actions: investing sixty seconds in creating a Wikipedia account and even spending a few more minutes in creating a user profile. Traditional lectures won’t die, I feel. Especially as in today’s networked environment they can provide opportunities for the audience to be active during the lecture. And, of course, you don’t need mobile devices, Twitter and a WiFi network in order to interact with large audiences. As can be seen from the accompanying image taken at the IWMW 2013 event, you can engage with your audience in more traditional ways! On Thursday 15 May I am giving an invited talk at the CILIP Cymru Wales Library and Information Conference 2014. The theme of this year’s conference is “Making a difference: libraries and their communities“. My contribution to this theme is entitled “Editing Wikipedia: Why You Should and How You Can Support Your Users“. In the talk I’ll be explaining why librarians and information professionals, whether working in academic or public libraries, should have a good understanding of Wikipedia and be able to support their users not only in consuming Wikipedia content but also in creating and updating Wikipedia content. 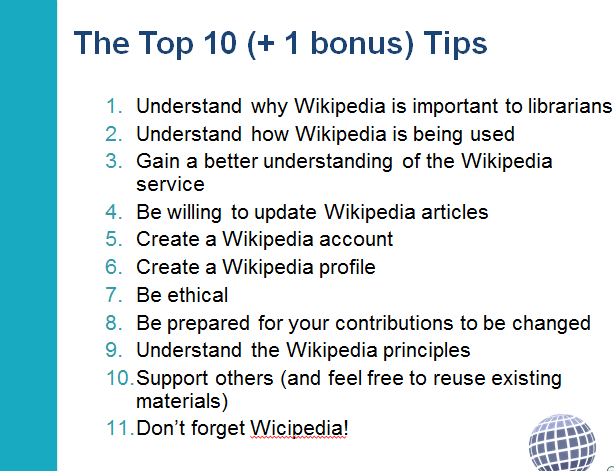 In the talk I’ll be giving my top ten tips for librarians who wish to use Wikipedia to support their community. These are summarized below. 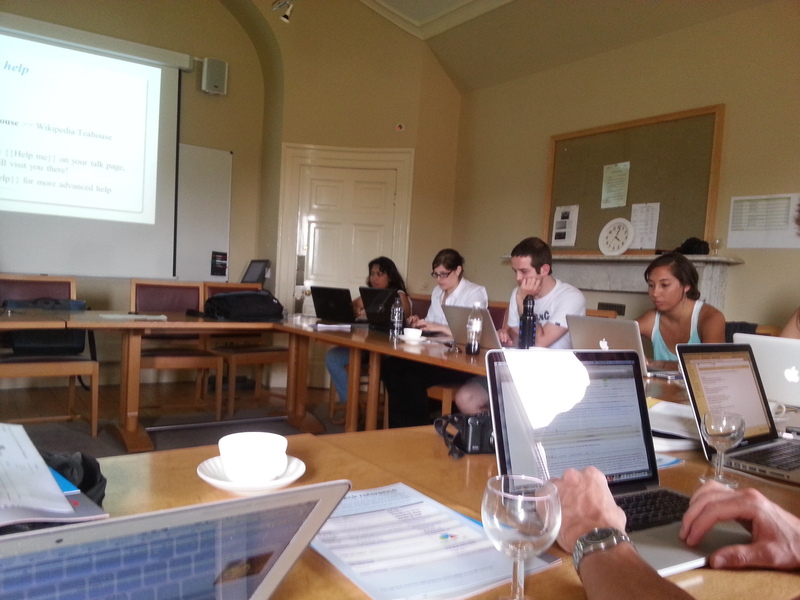 In a talk entitled Wikipedia in the library – the elephant in the (reading) room? presented at the LILAC 2014 conference Nancy Graham and Andrew Gray pointed out a perceived problem: “The kids these days are reading too many encyclopedias“. However rather than regarding the popularity of Wikipedia as a problem librarians should welcome the opportunity this “perfect teaching moment” can provide. We can help students how to tell the good from the bad; how to think critically about online material and how they can engage with the means of production. If you’re serious about ensuring public engagement in your research then you need to make damn sure your work can be incorporated into Wikipedia. Wikipedia is the most important engagement channel for your research. Wikipedia is an illustration of the way that academic work needs to change to benefit from a more educated public, a more networked world, in an age of information abundance. 21st-century scholars should be working with it, not against it. In light of the popularity of Wikipedia with the user community, it is suggested that librarians should gain an understanding of the value it can provide. Nancy Graham and Lisa Anderson outlined work at the University of Birmingham on Safe use of Wikipedia in the transition from school to University. Humphrey Southall’s talk on Introducing Students to Independent Research Through Editing Wikipedia Articles on English Villages described how “Each student on a large first year human geography course at the University of Portsmouth is assigned a different Wikipedia stub article, unedited for at least a year, about an English village. They are required to extend it “to provide a rounded description of the place and … an account of its historical development””. Librarians would be expected to understand advanced how search interfaces work in order to be able to support their user community. Similarly librarians should gain an understanding of the development of Wikipedia articles which can be seen from use of the View History option. The Talk page may also provide useful summary of discussions about the evolution and scope of Wikipedia articles. Ely Library is due to undergo development Mid 2014, with plans to move into the Jasmine Centre on Cowbridge Road. At some point during 2014 this will need updating. In addition to changes to the date this sentence doesn’t read very well – wouldn’t “Ely Library is due to undergo development by mid 2014” be an improvement? If you are a librarian or information professional should you take responsibilities for updating incorrect information and improving its readability, especially if such updates could be done in seconds? You can make updates to Wikipedia articles without having a Wikipedia account. But having an account and signing in when making updates has several advantages: as well as keeping a record of your contributions you need to be signed in in order to create new articles, join in discussions and have customised preferences. Although you do not need to create a profile page, such pages can be used to provide a summary of your interests and your involvement with Wikipedia. Creating a user profile can also provide an opportunity to learn Wikimedia markup language. A good approach to creating your user profile is to browse existing user profiles and make use of the markup of one’s which appeal to you. For example Msnancygraham’s profile is a good example of a simple profile whereas Lawsonstu’s profile contains more advanced markup features, as illustrated. When showing others how to use Wikipedia it’s not a good idea to encourage them to vandalise a page in order to demonstrate how quickly such updates are removed – remember that Wikipedia volunteers may have to remove such vandalism. The fact that anyone can edit Wikipedia articles has been regarded as a weakness of the service but it is now increasingly being acknowledged as a strength. However you should be aware that updates that you make may be removed or new articles deleted. If you are thinking about making significant changes to an article it would be advisable to use the article’s Talk page to state your intentions. If your viewpoint is held by an extremely small minority, then — whether it’s true or not, whether you can prove it or not — it doesn’t belong in Wikipedia, except perhaps in some ancillary article. Librarians will be well-positioned to support their users in making effective use of Wikipedia. This is particularly appropriate for the CILIP Wales conference in light of this year’s theme: “Making a difference: libraries and their communities“. As might be expected, the Wikipedia community is very supportive of openness and sharing so there is no need to design your training courses from scratch. This post has provided ten tips for librarians wishing to support use of Wikipedia. Since the talk I will be giving will take place at the CILIP Wales conference I felt it would be appropriate to provide an additional top for Welsh librarians or librarians working in Wales: Don’t forget Wicipedia! Wikipedia is great resource for open education, but what challenges need to be faced to make it into an even more valuable educational resource? It remains the most significant encyclopaedic reference based in user generated content which seeks to develop an “open commons” based on consensus approaches and use of Wikipedia’s “Five pillars” principles which includes content being provided from a neutral point of view. Participants with no experience of Wikipedia editing will be invited to create a Wikipedia user profile, and to understand the basics of creating and editing Wikipedia content. Experienced Wikipedia editors will have the option of sharing a lightning talk on what they consider to be its most significant challenges. challenges include[ing] a skewed demographic of editors, and a culture that can too easily descend into edit wars, and conflict between “inclusionists” and “deletionists”. Can we envisage changes to make Wikipedia better, or that could seed a better alternative? Could aspiring editors be required to learn and prove their understanding of the governance principles before being allowed to edit? Can consensus process be trained? And would different approaches such as those taken by GitHub, the P2P Foundation, etc. help to improve the culture? If you’ve an interest in going beyond the basics you may wish to consider attending the Cetis 2014 conference. Note that the online registration form is open for bookings. Yesterday I received a certificate which confirms that I am now an accredited Wikipedia trainer, after participating in the Training the Trainer workshop held in Cardiff on 1-2 February 2014. I am now a “Full Wikimedia Trainer” which, according to the Training the Trainers/Accreditation page, means that I am “Able to write and or deliver, Wikimedia training modules to a high standard“. Bringing in contributors with specific professional expertise, often via events in their own workplace. This is a broad category, covering librarians, scientists, JISC programme managers and others. Separate strands of ‘Institutions’ will probably evolve over time. As summarised below I am pleased that I will be able to make use of my Wikipedia knowledge and expertise in promoting its use within the higher education and library sectors over the next few months. The LILAC 2014 conference takes place at Sheffield Hallam University next week, from 23-25 April. I will be running a session on Getting to Grips with Wikipedia: a Practical Session which will help the information literacy librarians attending the session to register for a Wikipedia account and learn about basic Wikimedia markup by creating or modifying their user profile. After this I am supporting a session on Improving the Information Literacy Entry on Wikipedia: LILAC’s First Edit-a-thon! Since I feel that librarians have an important role in encouraging use of Wikipedia and supporting users who wish to create and update Wikipedia content and not simply consume it I am pleased to have been invited to give a plenary talk on “Editing Wikipedia: Why You Should and How You Can Support Your Users” at the CILIP Cymru Wales Conference 2014 on “Making a Difference: Libraries and their Communities”. The session presenters’ view of the challenges includes a skewed demographic of editors, and a culture that can too easily descend into edit wars, and conflict between “inclusionists” and “deletionists”. Can we envisage changes to make Wikipedia better, or that could seed a better alternative? Could aspiring editors be required to learn and prove their understanding of the governance principles before being allowed to edit? Can consensus process be trained? And would different approaches such as those taken by GitHub, the P2P Foundation, etc. help to improve the culture? The session will raise awareness of the key issues with Wikipedia, and prepare participants for more effective use of Wikipedia as consumer and author, and perhaps even as reformer. I hope these sessions will be of interest. Let me know if you’re planning on attending. The third annual Open Education Week (#openeducationwk) takes place from 10-15 March 2014. As described on the Open Education Week web site “its purpose is to raise awareness about the movement and its impact on teaching and learning worldwide“. Cetis staff are supporting Open Education Week by publishing a series of blog posts about open education activities. Cetis have had long-standing involvement in open education and have published a range of papers which cover topics such as OERs (Open Educational Resources) and MOOCs (Massive Open Online Courses). The Cetis blog provides access to the posts which describe Cetis activities concerned with a range of open education activities. My contribution to the series covers Open Education and Wikipedia: Developments in the UK. As I explained in a post which asked “How Are You Using Wikipedia?” I will be giving a presentation on use of Wikipedia in the UK’s higher education sector at the Eduwiki conference to be held in Belgrade on 24 March 2014. Since this post is published in a series on open education it seems appropriate to adopt open practices in the preparation of the talk. I am therefore ‘flipping’ my talk and have made my slides available on Slideshare (and embedded below) in advance of the Eduwiki conference.The slides are accompanied by this blog post which summarises the key points I intend to make in the talk. I welcome comments which I may be able to incorporate in the talk when I deliver it in a few weeks time. The availability of this blog post may also provide a complementary perspective on the slides which may be helpful in expanding on points which may not be obvious from viewing the slides in isolation. It seems appropriate for a talk about Wikipedia which is being hosted by a Wikimedia chapter to adopt Wikipedia principles of openness and citation of sources in the talk itself. The slides will therefore be available under a Creative Commons (CC-BY) licence. In addition the delivery of the slides will be available under the same licence, with recording or broadcasting of the talk being explicitly welcomed. The slides themselves will be made available in advance. The slides will contain embedded links to resources mentioned in the talk or supplementary evidence or assertions made. I will describe the initial resistance to use of Wikipedia in higher education. However we are now seeing growing acceptance of its value with recent editing sessions for groups such as research scientists and librarians indicating the growing interest. Ironically the title of a talk at the LILAC 2014 conference (“Wikipedia: it’s not the evil elephant in the library reading room“) suggests there is a need to address concerns that Wikipedia is an “evil elephant” which we may know exists but are reluctant to acknowledge. The title of an edit-a-thon session at the conference (“Improving the Information Literacy entry on Wikipedia: LILAC’s first edit-a-thon!“) again shows that this is a new area Progress is happening, but Wikipedia, and especially updating Wikipedia articles, should not, yet, be considered a mainstream activities in higher education. Safe Use of Wikipedia in the Transition from School to University by Lisa Anderson and Nancy Graham, University of Birmingham. These two talks addressed complementary aspects relevant to use of Wikipedia is higher education: how librarians can address information literacy by explicitly covering the strengths and weakness of Wikipedia and ways in which students can update Wikipedia articles as part of a formal assignment. The presentation will go into more detail of the key aspects of these two talks. I should add that the slides used by Humphrey Southall in his presentation are available on Slideshare. The funding of a Wikimedia Ambassador for the period July 2013 – March 2014 by the Jisc was a welcome development which demonstrated how a funding body was willing to fund an initiative aimed at encouraging take-up of Wikipedia within the UK’s higher education sector. The work of the Jisc Wikimedia Ambassador has included delivering six sessions and supporting three edit-a-thons, a Jisc infoKit on Crowdsourcing: the Wiki Way of Working and a project blog as well as a series of reports on the work. Education will be a key theme throughout the whole event, and while we will be honouring past achievements, this year Wikimania will always be looking forward to the Future of Education. Overcoming friction: “librarians and educators are starting to teach students how they can use Wikipedia effectively. Like any other encyclopaedia, students are being shown how to use the site to find the helpful links to primary and secondary sources that are precisely the material students should be citing in their research”. Knowledge is produced, not consumed: “Instead of being passive receivers of information, students become the creators and curators of knowledge. Wikipedia becomes an opportunity, not a threat, to formal education, and the educators’ role becomes facilitating a shift from simply teaching answers, to teaching how to ask questions”. These two areas reflect the topics of the talks given by Lisa Anderson / Nancy Graham and Humphrey Southall which I highlighted earlier in this post. Promoting use of other Wikimedia projects: A poster on PastPlace: the historical gazetteer service from the people who brought you A Vision of Britain through Time highlights plans for building on the Vision of Britain work which Humphrey Southall described in his talk at Eduwiki 2013. This project will build on data from Wikidata, “a free knowledge base that can be read and edited by humans and machines alike“. The article goes on to explain how “the term “crowdsourcing” is a portmanteau of “crowd” and “outsourcing“. However the relevance of crowdsourcing is not widely appreciated in higher education, with the word “outsourcing” possibly leading to concerns due to its political connotations. One of the significant deliverables from the Jisc Wikimedia Ambassador project was the production of a Jisc infoKit on Crowdsourcing. Resources such as this should help to provide a better understanding of the theories behind crowdsourcing and its relevance to Wikipedia. But that community also constructed barriers that deter the newcomers needed to finish the job. Perhaps it was too much to expect that a crowd of Internet strangers would truly democratize knowledge. Today’s Wikipedia, even with its middling quality and poor representation of the world’s diversity, could be the best encyclopedia we will get. Training the Trainers course, Cardiff, 1-2 February 2014. Licernsed under CC-BY-SA. Maximising the pool of potential contributors: Last week an article in the Guardian pointed out that “It is thought that only around one in 10 of its editors are female“. In another article published the previous week in the Guardian entitled “Stop female scientists being written out of Wikipedia history Dame Athene Donald, fellow of the Royal Society & Professor of Experimental Physics at Cambridge University went on to point out that “Many female scientists are either not there at all on Wikipedia or just [have] stubs. The concerns regarding lack of female involvement in Wikipedia editing are illustrated by the photograph of the participants at the Training the Trainers course, with the only woman in the photograph being the course trainer. However such concerns, together with concerns regarding the lack of content about noteworthy females, are being addressed. In March there are no fewer than six events which are addressing these issues: Women in Science Wikipedia Edit-a-thon; Women’s Art Practices editing event; Women Archaeologists editing event; Scottish Women in Contemporary Art Edit-a-thon and Scottish Women in Computing Edit-a-thon. As well as the need to increase the pool of female contributors to Wikipedia there is also a need to make it easier for people with disabilities to create content in Wikipedia. The Accessibility of the Wikimedia UK website project focus is on making Wikipedia resources more accessible for people with sight problems; hearing problems; mobility problems and cognitive impairments. However in conjunction with the WikiProject Disability project which aims to “co-ordinate the improvement and creation of articles related to Disability” we might expect to see edit-a-thons being organised which aim to provide people with disabilities with the the skills needed to contribute to Wikipedia. I’ve given a brief view of various Wikipedia developments within the UK’s higher education sector and provided suggestions on further developments which would help to take Wikipedia beyond the early mainstream adopters and become more embedded within the higher education sector. 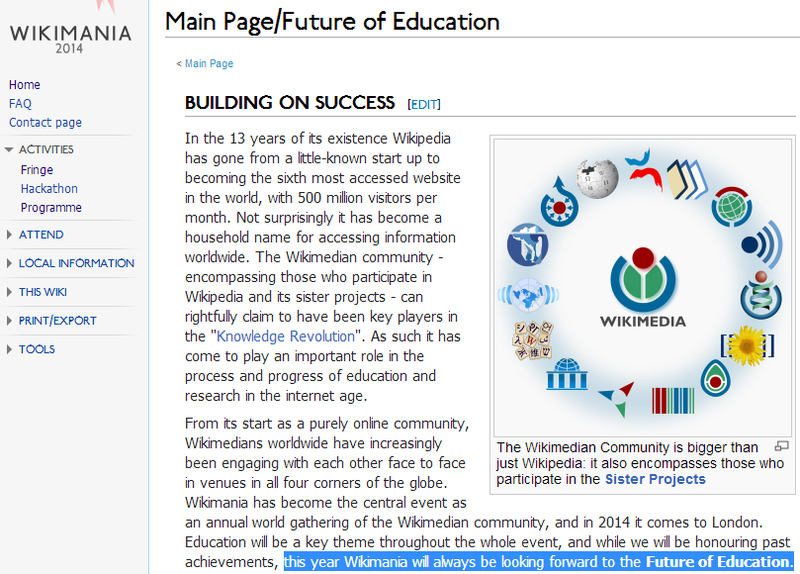 Would anyone like to contribute further suggestions for the development of Wikimedia UK’s education strategy? How Are You Using Wikipedia? Wikipedia logo. Used with a CC-By licence from Wikimedia Commons. I signed up to Wikipedia in 2004 in order to create an entry for my hobby: rapper sword dancing. I saw the value of the service in providing a easy-to-use content creation tool which would benefit from crowd-sourcing content in order to maintain the content. However such ease-of-use and the crowd-sourcing model, in which anybody could edit the content, was initially not appreciated by many in the educational and library sectors. So although I created a small number of articles related to my professional interests (including Amplified conference and Microattribution) and encouraged use of Wikipedia (in blog posts such as Having An Impact Through Wikipedia, How Well-Read Are Technical Wikipedia Articles? and How Can We Assess the Impact and ROI of Contributions to Wikipedia?) I felt that such work was not appreciated as having value in promoting innovative use of technologies within the sector. It was therefore only after having received notification of the cessation of Jisc funding for UKOLN, my host organisation, that I took advantage of our funder’s agreement that we could spend some time developing our professional skills to prepare for life after redundancy, that I became more involved with Wikipedia activities. This included joining Wikimedia UK and taken part in two Wikimedia UK events: the Queen Victoria’s Journals University of Oxford editing day which provided an initial opportunity to familiarise myself with the format of an editing workshop and participation in a Sphingonet Wiki workshop (see accompanying photograph), which provided me with initial experience in working with other Wikimedia experts. Since leaving UKOLN I have continued by involvement with Wikipedia including taking the lead role in Facilitating a Wikipedia Editing Session at the SpotOn 2013 conference and attending the EduWiki 2013 conference. I will also be running a Wikipedia editing workshop session at the LILAC 2014 conference and supporting an edit-a-thon at the conference. Such work is appropriate for my new role as Innovation Advocate at Cetis, since my work encourages use of innovative practices as well as innovative technologies. Interestingly the value of Wikipedia is now being appreciated by Jisc who, in conjunction with Wikimedia UK, are funding a Wikimedia Ambasssador. 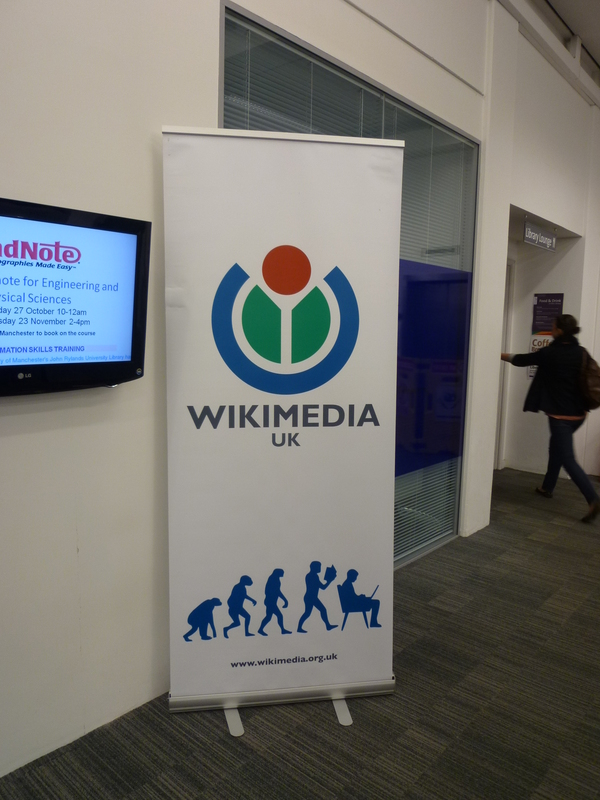 I’m pleased that this post has been funded and that Jisc are helping to promote take-up of Wikipedia and related Wikimedia services across the sector. I hope this will help in seeing active use of Wikipedia move beyond the early adopters and become mainstream. What Else Is Happening in the UK Higher / Further Education Sector? 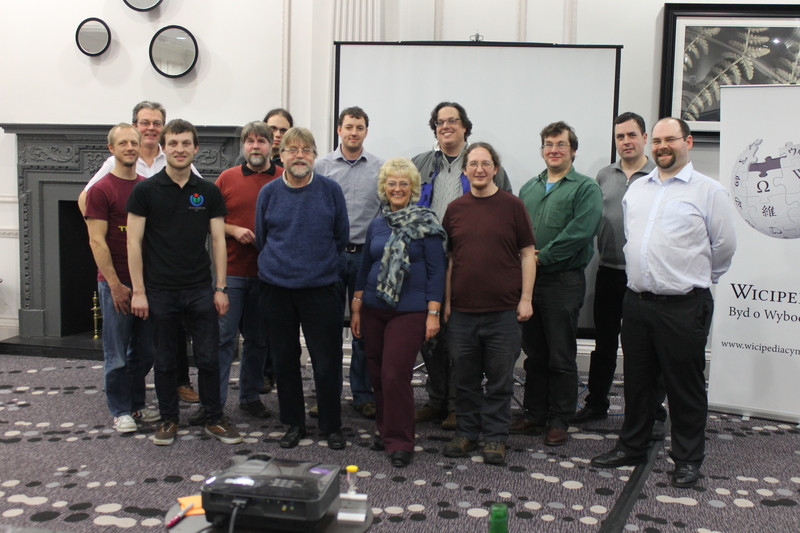 The Jisc Wikimedia Ambassador post has been funded from July 2013 to March 2014. There will therefore be a need to ensure that sharing of approaches taken to use of Wikipedia continues to take place after the funding for the post finishes. The Eduwiki 2013 conference held in Cardiff 0n 1-2 November 2013 provided a valuable opportunity to hear about ways n which Wikipedia is being used across the broad educational sector. I was particularly impressed by talks on Introducing Students to Independent Research Through Editing Wikipedia Articles on English Villages by Humphrey Southall and Safe use of Wikipedia in the transition from school to University by Lisa Anderson & Nancy Graham. But what else is happening in the sector? I have to admit to a personal interest in this question as, as described on the Wikimedia UK blog, on 23 March I will be giving a talk at the EduWiki Serbia 2014 conference on educational use of Wikipedia and other Wikimedia tools in the UK. I would like to include further examples of work taking place which I am unaware of. If you are working in this area I would love to hear from you. Feel free to leave a comment on this post or get in touch. Thanks. A post on the Spotlight on the Digital blog highlighted a ‘treasure chest’ of valuable services. 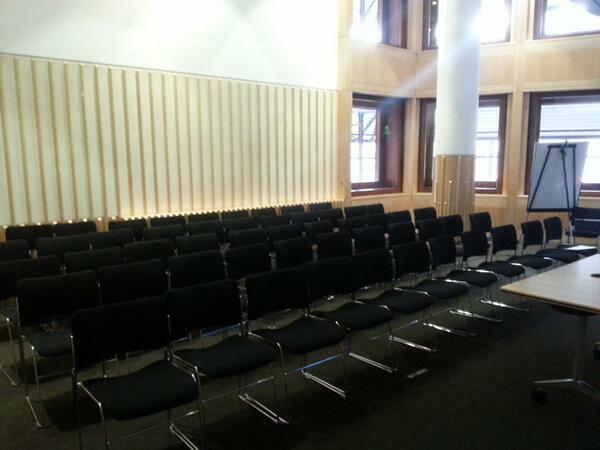 On Friday (15 November 2013) I attended a “Spotlight on the Digital” meeting at the Jisc offices in London. Spotlight on the Digital is a “collaboration between Jisc, RLUK and SCONUL to identify and disseminate fruitful approaches to make public funded digitized collections and their content items more discoverable for students and researchers (and the public more generally)“. As described in a blog post entitled Spotlight on the digital: how discoverable are your digitised collections? “The need for Spotlight emerged out of the concern that digitised collections are not as “discoverable” as they could be through the channels and devices most commonly accessed by users“. After the introduction Martin Poulter gave the first brief presentation of the day in an agenda item titled “Infiltrating popular web destinations“. Martin, who is currently working as the Jisc Wikimedia Ambassador summarised the benefits which can be provided by Wikipedia and other Wikimedia projects, but began by telling us how the title of the talk was misleading: rather than talking about infiltrating popular web destinations, providing information about scholarly and cultural resources using Wikipedia should be regarded as a means of celebrating the value, importance and significance of the resources. I was pleased to support Martin’s brief presentation. I pointed out the need across the higher education sector to both highlight the benefits of Wikipedia and to provide advice and support for those who wished to contribute content to Wikipedia and other related services such as uploading images to Wikimedia Commons. However I also pointed out that there may be risks associated with using Wikipedia. But rather than ignoring such risks, those are feel that Wikipedia has an important role to play within the sector should be pro-active in documenting the risks and associated risk minimisation strategies. There is also, as Martin pointed out, a need to appreciate the risks of using conventional tools and services. Back in 2008-2009 I was involved in the development of risk management strategies to assist those who wished to make institutional use of Web 2.0 services but were concerned about comments such as “the services would not be sustainable“, “services were ‘walled gardens’“, “services were not available as open source“, “content hosted on Web 2.0 services could infringe copyright legislation“, etc. The proposed risk management strategies were initially described at an invited conference presentation given at the Bridging Worlds conference at the National Library of Singapore and subsequently published in the Program journal with a follow-up paper entitled “Empowering Users and Institutions: A Risks and Opportunities Framework for Exploiting the Social Web” being presented at the CULTURAL HERITAGE online conference. Intended use: Rather than talking about Social Web services in an abstract context (“shall we have a Facebook page” for example) specific details of the intended use should be provided. Perceived benefits: A summary of the perceived benefits which use of the Social Web service are expected to provide should be documented. Perceived risks: A summary of the perceived risks which use of the Social Web service may entail should be documented. Missed opportunities: A summary of the missed opportunities and benefits which a failure to make use of the Social Web service should be documented. Costs: A summary of the costs and other resource implications of use of the service should be documented. Risk minimisation: Once the risks have been identified and discussed approaches to risk minimisation should be documented. Evidence base: Evidence which back up the assertions made in use of the framework. It should be noted that it was pointed out that the framework could also be used with conventional tools and services which were procured and deployed locally; it would be a mistake to suggest that only Cloud services are liable to go out of business or be susceptible to changed terms and conditions. Five years on from the initial paper there is now a much greater willingness to accept the value of Cloud services to support institutional activities, as is evident from Janet’s announcement earlier this year that “Over 18 million students and staff to benefit from faster, more secure cloud-computing” and the role that this Jisc service has in providing Cloud Services for Education Agreements which includes contracts for Microsoft Office 365 and Google Apps in Education. But this does not mean that risks have gone away. Rather, I would argue, there is a need to have a better understanding of such risks and ways of addressing the risks or even accepting some levels of risks. After all there may be risks in getting out of bed in the morning and driving to work, but we are prepared to accept such risks! In the case of Wikipedia I would highlight the following risks, the likelihood of the risks occurring and approaches for risk minimisation (or acceptance). 1 Wikipedia service is not sustainable. Not able to answer. As a global company the Wikimedia Foundation is able to seek funding from ventures around the globe. It is also successful in having a high profile. 2 Other Wikimedia services, such as Wikimedia Commons, are not sustainable. Not able to answer. See above. 3 Content hosted in Wikipedia changes. Very likely, but a feature not a risk! Wikipedia articles can be changed rapidly, which can be advantageous. Note that risks in use of conventional text books, which cannot be updated easily, such be highlighted as a risk in use of conventional teaching and research resources! 4 Content hosted in Wikipedia is deleted. Possible in some areas. Articles published Wikipedia can be deleted. If articles are merged with existing articles or renamed, appropriate redirects will be provided. Articles could also be deleted if they are felt not to be noteworthy. However in such cases articles are unlikely to be used in an institutional context. 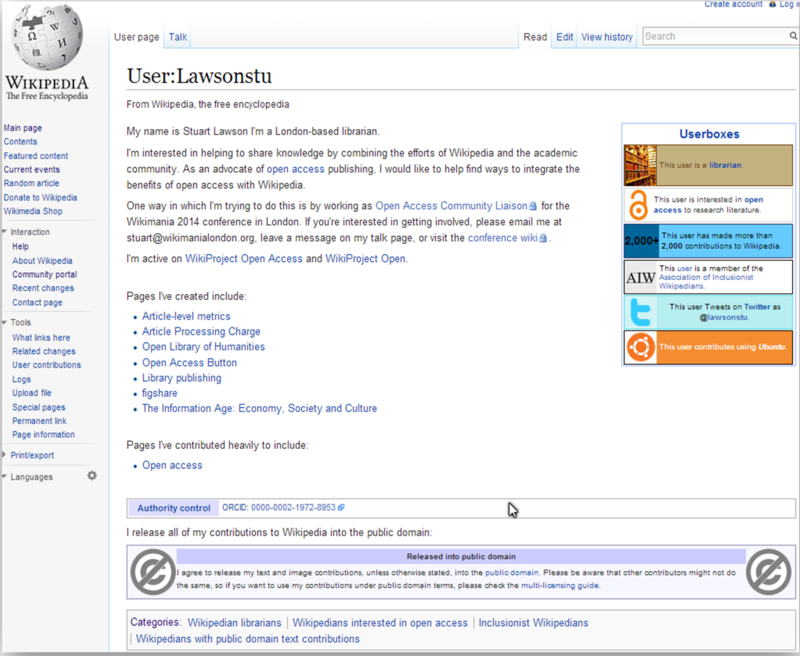 5 Wikipedia user interface (UI) changes. Very likely, but a feature not a risk! 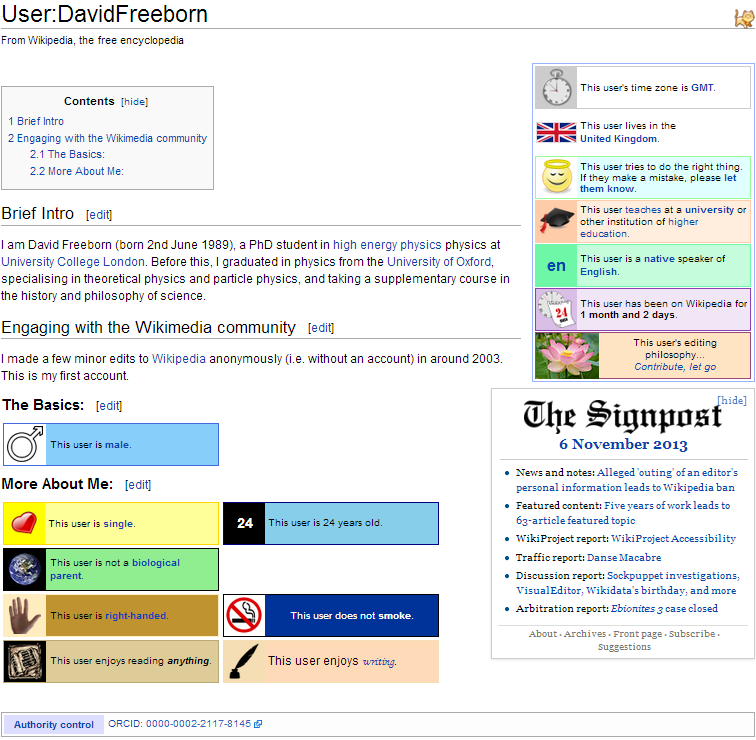 The UI for Wikipedia services can (and does) change. However this is the norm for online services. I’d welcome comments on this risk register. I should also add that there are associated risks in failing to make use of Wikipedia and in the risks not taking place! There are many opportunities which Wikipedia can provide, although this post focusses on the risks. Netscape made a very successful IPO on August 9, 1995. The stock was set to be offered at $14 per share, but a last-minute decision doubled the initial offering to $28 per share. The stock’s value soared to $75 during the first day of trading, nearly a record for first-day gain. The stock closed at $58.25, which gave Netscape, an unprofitable firm, a market value of $2.9 billion. The company’s revenues doubled every quarter in 1995. Netscape’s success (which crystallized the “Netscape Moment”) landed Andreessen, barefoot, on the cover of Time Magazine. Might it be appropriate for organisations, such as the Wikimedia Foundation, to publish a risk assessment for its projects? This would appear to be aligned with Wikimedia’s culture of openness and transparency. It would also make people more aware of the risks in using other services, such as the risks of using Google services which subsequently became ‘sunsetted’. 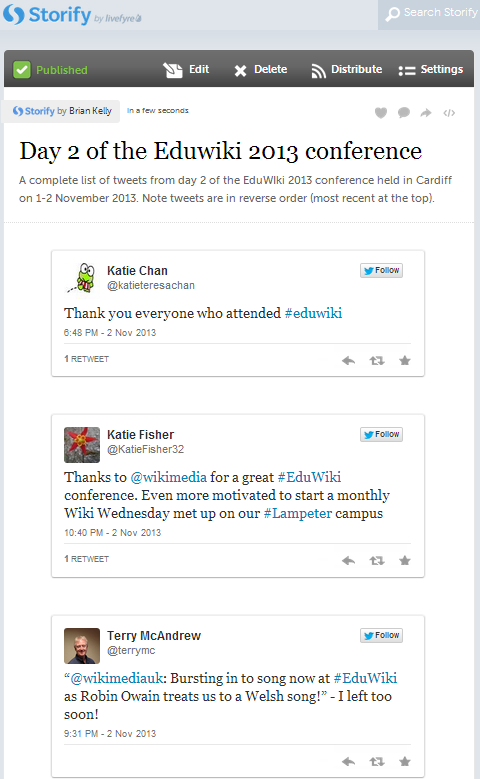 On Friday and Saturday, 1 and 2 November 2013, I attended the EduWiki 2013 Conference. This was the second EduWiki conference organised by Wikimedia UK; EduWiki 2012 was held at the University of Leicester in September 2012. This was also my first event in my new role as Innovation Advocate at Cetis. As I mentioned in a previous post I only started at Cetis on Monday, so I had little time to become acclimatised to my new role! It was pleasing to receive messages of congratulations st the conference from a number of people at the event who had seen the announcement either on this blog, on my Facebook page or from my LinkedIn profile (incidentally footnote provides some speculation on the metrics for the numbers of responses to the announcement) . It does seem to me that Wikipedia could be of interest to Cetis, as an emerging technological resource which appears to be relevant to teaching and learning. Did the two days I spent at the conference confirm such views? The first day of the Wikipedia conference began with the welcome to the conference being provided by Toni Sant (Wikimedia UK’s Education Organiser) , with the opening remarks on the conference given by Martin Poulter, the Jisc Wikimedia Ambassador in a talk entitled “Where’s the Edit Button on this Textbook?“. After the introductions, Robin Owain, the Wales Manager for Wikimedia UK gave a talk in Welsh with instant translation for English speakers via headsets. Robin’s talk provided the political and cultural context for the following keynote talk and made the links with Wicipedia, the Welsh language version of Wikipedia. “Wales is a small country. That’s our greatness. “Do the small things” is our motto” explained Robin, who went on to inform the audience that “Wales is the land of open content“. Such approaches to openness and doing small things, but doing them well has led to Wicipedia being the most popular web site in the Welsh language. it was pleasing to see that many of the speakers at the conference backed up their assertions with evidence. In Robin’s case we heard about the usage statistics for Wicipedia, as illustrated. Each student on a large first year human geography course at the University of Portsmouth is assigned a different Wikipedia stub article, unedited for at least a year, about an English village. They are required to extend it “to provide a rounded description of the place and … an account of its historical development”. All villages are far from Portsmouth and students are banned from visiting them, so we emphasize that this is an exercise in finding, evaluating, interpreting and citing sources created by others, mainly online. All the villages are Civil Parishes, meaning that modern census data is available for them on the government’s Neighbourhood Statistics site, and historical census data are available on our own site A Vision of Britain through Time. Marks are given for the inclusion of required systematic information (completing the infobox); effective use of sources to create a sense of place; originality in use of sources; quality of layout and illustration; quality of referencing (do hyperlinks work? ); engagement with other Wikipedia users (responding to comments! ); and adherence to Wikipedia guidelines. The second day of the conference provided another two interesting talks related to use of Wikipedia in higher education: Lisa Anderson & Nancy Graham provided a librarian’s perspective in a talk on “Safe use of Wikipedia in the transition from school to University” and Darren Stephens facilitated a workshop session on “Exploring the Education Program/Courses Extension for UK HEIs“. Lisa & Nancy’s talk provided a rebuttal of Dave White’s talk which asked “What’s left to teach now that Wikipedia has done everyone’s homework?“. In this talk, which concluded the first day, Dave White proposed a variant on the first rule of the Fight Club. 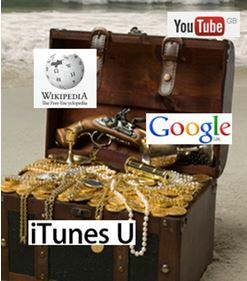 The first rule of Wikipedia in education is: “You don’t talk about Wikipedia and the learning black market“. The reason for this was based on Dave’s research which showed that although students feel that their lecturers don’t approve of use of Wikipedia, in reality they do use Wikipedia and use references obtained for Wikipedia articles – although they don’t necessarily read the references. There is therefore a learning black market based on content from Wikipedia which lectures must not be made aware of! Lisa & Nancy’s talk described how librarians at Birmingham University appreciate that students will use Wikipedia, and therefore sought to ensure that students are made aware of best practices for using Wikipedia. They ensure their students are made aware of the history pages for Wikipedia articles; how easy it is to edit articles, which includes vandalising articles or adding errors, mistakes or deliberately incorrect or misleading content but also how such changes are normally spotted by Wikipedia volunteers which can remove such content. I found this a useful talk on how a group of librarians are understanding how their users use Web resources and respond by engaging withe such realities. But Dave White’s evidence of student belief that use of Wikipedia is frowned upon by academics and librarians shows that further work needs to be done. 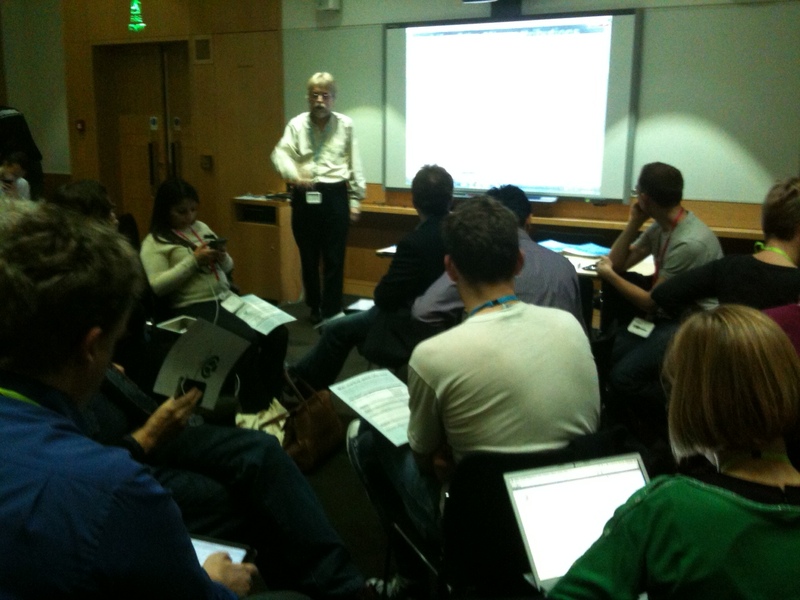 One tweet summarised the talk: “Librarians’ attitudes to Wikipedia are changing @msnancygraham #EduWiki”. But to what extent does this reflect the reality of how university librarians are informing their students (and staff) of the relevance of Wikipedia, I wonder? As I suggested to Nancy after her talk, perhaps gathering evidence across the sector would be useful for a paper at next year’s LILAC 2014 information literacy conference. The final session I’ll comment on in this post is Darren Stephens workshop on “Exploring the Education Program/Courses Extension for UK HEIs“. Darren explained that the education extension installed on Wikipedia has had minimal take-up in the UK, with only two universities in England making use of it in the academic year 2012/13. The Education Program extension for MediaWiki adds features to Wikipedia to support classes of students editing articles, including structured Institution and Course pages and feeds of recent activity by students. However as we learnt during the workshop session, the extension is poorly documented and the software has a poor user interface. Comments that the software enabled staff to monitor how their students made use of Wikipedia to complete assignments also led to concerns regarding the privacy implications’ even if the software provides a dashboard which gives a window on publicly available information, there will still be issues regarding potential concerns that students have been required to make information publicly available and also that institutions may have policies which require student activities to be analysed prior to assessment. Rod Dunican, Director of Global Education at the Wikipedia Foundation had opened the second day with a plenary talk on “Wikipedia in Education: Adventures in Learning“. I was fortunate to spend some time over lunch talking to Rod and hearing more about the Wikipedia Foundation and the Wikipedia Education Program. In my opening remarks in this posts I wondered whether the conference would confirm my feelings of the relevance of Wikipedia for the higher and further education sectors. I’m now convinced of the importance of Wikipedia in open educational practices. There will be a need to be able to provide further evidence of the value of Wikipedia (beyond the usage statistics which several speakers provided) and learn from the successes (and failures) of the early adopters. I’ll conclude with a few tweets made during the conference. I hope a video of the song which concluded the conference will be published! “anyone archiving #eduwiki tweets? Would that be a good idea?” asked Simon Knight on the opening day of the conference. Although the question was directed at @wikimediauk I saw the tweet and immediately created a Twubs archive of the #eduwiki tweets. “That’s the power of the crowd – fixed in two minutes flat! 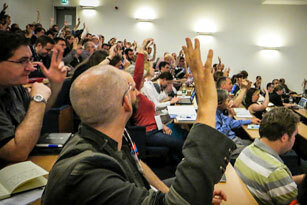 #eduwiki” responded @wikimediauk . I agree, one shouldn’t have to wait for employees or officers of an organisation to carry out work which interests bystanders can do. That’ after all, can be regarded as the ‘Wikipedia way’. In addition to the Twubs archive, I also created Storify archives of the tweets posted on day 1 and day 2 of the conference. I should add that although I normally use Storify to curate an edited summary of event tweets published in chronological order, with tweets omitted if I feel they are of little value and annotations provided, such as links to speakers slides, in this case due to lack of time I published the full set of tweets in reverse chronological order. I did this shortly after the event was over so that an archive was available in a timely fashion, especially for others who may be wishing to publish a report on the conference. I would also add that the full archive may be of value to others who may wish to create an annotated story (e.g. of talks of particular interest). Again the process of publishing something incomplete which can be enhanced can be regarded as the Wikipedia way. I was interested to see that I had received 94 ‘likes’ and 43 comments for the Facebook status update, 33 ‘likes’ and 12 comments on a LinkedIn update for my new job but only 16 comments to the original blog post.Might this suggest that Facebook and then LinkedIn are more effective than blog posts in alerting people to information such as a change of job, I wonder? My long-standing involvement with Wikipedia (I registered for the service in February 2004 and created my first page later that month). My belief that JISC should make greater use of Wikipedia, as illustrated by a post entitled What Is JISC? which I published in August 2008. My experiences of Having An Impact Through Wikipedia which I summarised in July 2010. A benchmarking post which, in July 2010, provided some answers to the question How Well-Read Are Technical Wikipedia Articles? A follow-up post in September 2010 which asked How Can We Assess the Impact and ROI of Contributions to Wikipedia? 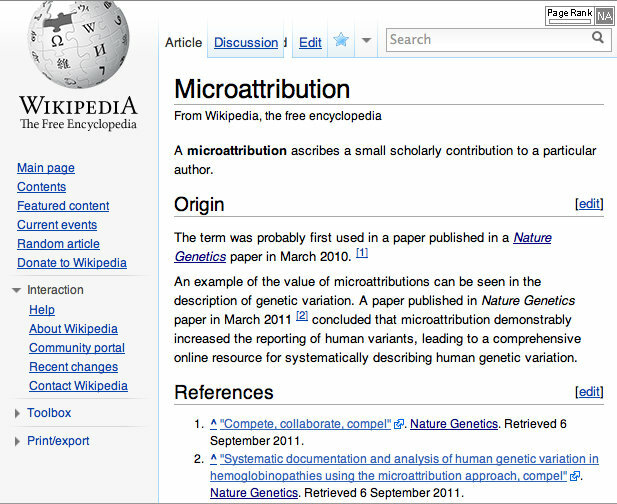 A post on Microattributions, Wikipedia and Dissemination which described how I created a Wikipedia article on Microattribution and encouraged others to help improve the quality of the stub item. A guest post on Librarians meet Wikipedians: collaboration not competition! 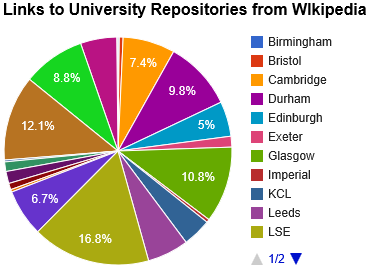 which provided information on how Wikimedia UK are looking to encourage take-up of Wikimedia within the higher education sector, including participation from librarians. A personal commitment to open practices, as illustrated by the open sharing of my professional practices on this blog. I was very pleased to receive several letter of support from those who recognised my pro-active approaches to openness, my strong links across the sector, my experience in running events and my knowledge of the higher education sector in general and the Jisc community in particular. However the bid was not successful. Although the evaluation panel “noted the strength of the proposal in terms of its academic focus and a sound methodology” they felt that “the lead consultant’s track-record as a Wikipedian to be insufficiently evidenced and that the link to the Wikimedia community was not sufficiently strong“. I would not disagree with these comments; although I have created and edited Wikipedia articles over an extended period I have little experience in training others to use Wikipedia. I subsequently learnt that the successful bid had been submitted by Martin Poulter, University of Bristol. I have known Martin for some time (probably over 10 years) and am very aware of his in-depth expertise on Wikipedia and his active involvement in the Wikimedia UK community. I’m happy to give my congratulations to Martin. The purpose of the training is to disseminate skills and knowledge leading to improved coverage and accuracy of articles relating to information produced by Jisc funded programmes presented on Wikimedia projects. My work as UK Web Focus has been primarily focussed on supporting the higher education sector, rather than working with Jisc projects and programmes (although I was involved in work such as providing a framework for the selection of standards for Jisc programmes, as well as Jisc development activities such as the JISC e-Framework and the JISC Information Environment). However after submitting the proposal I realised that I would welcome the opportunity to engage more directly with the sector in encouraging greater take-up of Wikipedia and other Wikimedia projects. I have therefore joined Wikimedia UK and taken part in two recent Wikimedia UK events: the Queen Victoria’s Journals University of Oxford editing day provided an initial opportunity to familiarise myself with the format of an editing workshop and this was followed by participation in a Sphingonet Wiki workshop (see accompanying photograph), which provided me with initial experience in working with other Wikimedia experts. My bid for the Jisc Wikimedia Ambassador residency included strong support from a number of institutions who were looking for opportunities to embed expertise in use of Wikipedia within their institution, as well as ensure that relevant information about institutional activities is made available in Wikipedia, in ways which conform with key Wikipedia principles including the need for information to be provided from a Neutral Point of View. During the summer I will be updating my skills in Wikipedia (and I intend to finish reading a book I purchased recently on How Wikipedia Works And How You Can Be A Part Of It. I then intend to offer a portfolio of training workshops based on the skills and expertise I have gained during my time at UKOLN, including training for a number of Social Web services including Wikipedia. If you have an interest, please get in touch. Guest Post: Librarians meet Wikipedians: collaboration not competition! As part of the series of guest blog posts which describe how the higher education sector is engaging with various aspects of openness Simon Bains, the Head of Research and Learning Support and Deputy Librarian, The John Rylands University Library at University of Manchester, describes how the university library is engaging with Wikipedia. It isn’t really news to say that the world libraries inhabit has changed almost beyond recognition in less than 20 years. Perhaps with the benefit of hindsight it will be possible to make sense of the rapid technological change and resulting shift in behaviours which combine to challenge the collections, services and perhaps the very existence of libraries. Whilst we continue to live through this information revolution, we seek to make educated guesses at the next trend, respond as we can to the very different expectations of our user communities, and develop strategies to ensure we remain relevant and sustainable in challenging times. Transition to online from print – published content, particularly journals, being made available online and becoming, fairly quickly, the dominant delivery channel. Challenges to traditional models of publishing – the rise of the open access agenda, and a general trend towards widespread support for openness, not just for published material but for underlying data, with a view to fostering sharing, reuse and linking. The Social Web – interaction and conversation, sharing, tagging, developing personal networks for both social and business purposes. Publication is no longer primarily about dissemination, but about sharing, reuse and conversation. The development of large scale global public and commercial content hubs which have grown to dominate the ways in which information is published, discovered, and shared. These, of course, aren’t entirely independent developments, and can instead be seen as components of an evolutionary (if not revolutionary) process which has brought us to today’s information landscape. Equally, it is clear that change continues, and recent challenges to traditional scholarly publishing models serve to underline that. The creation of one of these ‘hubs’ is the focus of this blog post. In just a few years we have seen the very rapid ascendency of Wikipedia as the preferred starting point for the sort of reference enquiry that would once have been directed to a traditionally published encyclopaedia, or a library reference desk. Despite scepticism, it has become a hugely popular resource, with evidence to support the reliability of crowd-sourced factual information, as a result of strict editing policies and zealous, perhaps over-zealous, editors. In 2007, whilst Digital Library Manager at the National Library of Scotland I was interested to read of a project to use it to make library collections more widely known, and this encouraged me to initiate work at to do likewise. Unfortunately, the timing was not good, as concern about the credentials of editors, and allegations about attempts to influence Wikipedia entries had resulted in very careful vetting, and an aversion to anything which even hinted at advertising, even from the cultural sector. Some forays into relevant Wikipedia entries in fact resulted in my web developer’s account being shut down, almost immediately. Somewhat discouraged, we directed our effort at the more welcoming global networks, such as Flickr and YouTube. Since then, Wikipedia seems to have adopted a more mature stance, still managing entries very carefully, but recognising that partnership with organisations with information which enriches its entries is to be welcomed rather than resisted (although a recent verbal exchange with a Wikipedia editor makes me think that this is still somewhat dependent on the outlook of individual editors). I was very interested to see the creation of the concept of the ‘Wikipedian in Residence’ at the British Museum, although my move from the National Library back into HE required a focus on other priorities. 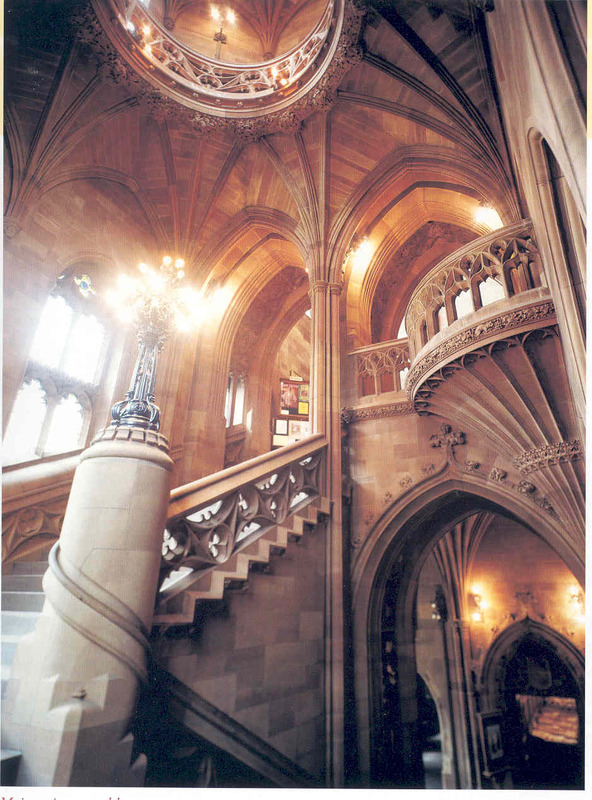 My move to The John Ryland University Library at the University of Manchester coincided with contact from Wikimedia UK, who were now actively seeking partnerships with education institutions, recognising the mutual benefit of working with students, academics and libraries to foster more effective use of Wikipedia as a resource, to encourage content creation and editing by experts, and to link entries to relevant resources. As a Library at a major research intensive institution, with the additional responsibility of steward of an internationally important special collections Library, we were identified as a particularly valuable pilot partner. For our part, influenced very much by the sort of strategic thinking coming from organisations like OCLC, which encouraged libraries to collaborate with large information hubs, we were very enthusiastic about a partnership which would help us connect to a global network level hub, and also address the digital literacy agenda. We have begun the engagement process, which we hope will develop into a substantial project which includes a ‘Wikipedian in Residence’. 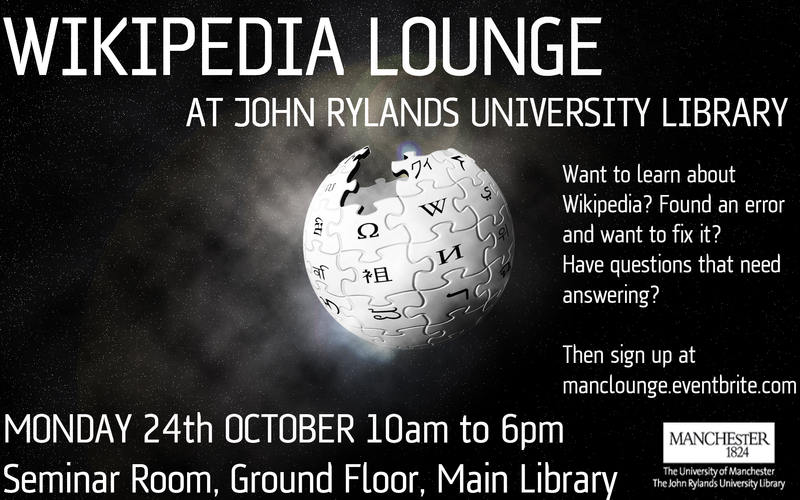 To date, we have hosted a ‘Wikipedia Lounge’, which saw academics and students meet Wikipedians to learn more about getting involved and creating content. 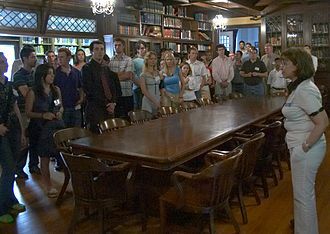 This event attracted academics, students and librarians, and we have plans to repeat it. We are now in discussions with Wikimedia UK about setting up a 12 month pilot project which would see a Wikipedian in Residence based at the John Rylands Library, working with our curators, students and academics to expose our collections, encourage further research and learning, develop a network of Wikipedians at Manchester (we already have some), and place Wikipedia within our digital literacy strategy as a powerful tool which when used effectively can play an important part in University teaching and research. There are already a number of references to our collections in Wikipedia entries, e.g.in biographical pages such as that of the author Alison Uttley, which serve to demonstrate the very great untapped potential. 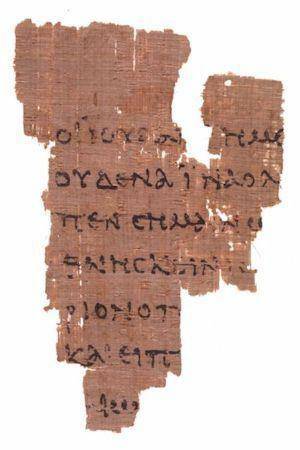 Perhaps the best entry which focuses on a specific item on our collections is for the Rylands Library Papyrus P52, also known as the St John’s fragment (illustrated) which ranks as the earliest known fragment of the New Testament in any language. Of course there are concerns about Wikipedia: it may not be reliable; it can be used as an easy substitute for comprehensive research and study; it can be difficult to change erroneous content, etc. But to ignore it or dissuade students from its use reminds me of the approach that was sometimes taken in the face of the rapid rise of Google in the late 1990s. It is a battle we are unlikely to win, and so much more could be achieved by working with, not against, the new information providers, especially when so much of what we are about has synergy: open access, collaboration, no profit motive, etc. It is early days for us in this engagement at the moment, but I have high hopes. And I’m sure that when we introduce our Wikimedia UK contacts to the wonders of the John Rylands Library, they will find it impossible not to see the obvious potential! A few days ago I read Steve Wheeler’s post on Content as Curriculum? having being alerted to it by Larry Sanger’s post on An example of educational anti-intellectualism to which Steve provided a riposte in which Steve argued the need to Play the ball, not the man. From the blog posts I learnt that Larry Sanger is a co-founder of Wikipedia and, as described on his blog is the “‘Founding Editor-in-Chief’ of the Citizendium, the Citizens’ Compendium: a wiki encyclopedia project that is expert-guided, public participatory, and real-names-only”. I have to admit that I had forgotten about Citizendium but the little spat caused me to revisit the Web site. While searching I came across a discussion entitled Why did Citizendium fail? and yes, it does seem that this “endeavor to achieve the highest standards of writing, reliability, and comprehensiveness through a unique collaboration between Authors and Editors” has failed. But although we often talk about success criteria, it can be more difficult to identify failures. How then, can we describe Citizendium as a failure? A few years ago I signed up for a Citizendium account. In order to register you need to provide your real name and include “a CV or resume … as well as some links to Web material that tends to support the claims made in the CV, such as conference proceedings, or a departmental home page. Both of these additional requirements may be fulfilled by a CV that is hosted on an official work Web page“. In comparison we can find that the Web Accessibility entry in Wikipedia has been edited 575 times by 277 users. 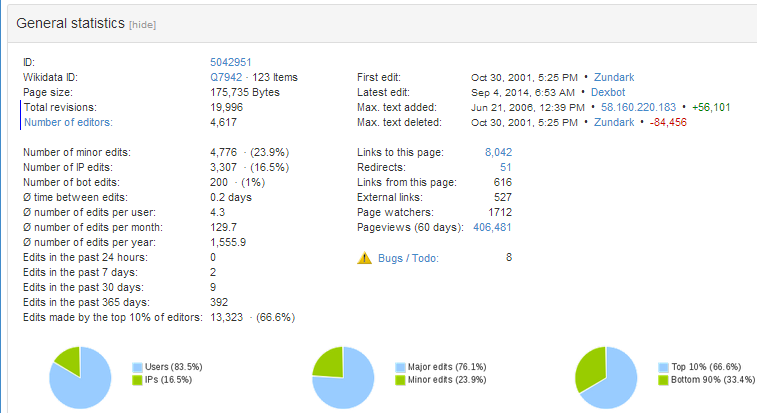 There were also 10,911 views in November 2011. With the rocket development of Internet, the techniques used for building web pages is improving all the time, which not only brings people more information but new experience of surfing on the Internet. Many techniques have been applied to enrich the web page these years, from totally the plaintext in early 90’s, first to web page with pictures and then that with embedded sounds. Later, Sun Microsystems proposed Java Applet, which was popular for not long time until being conquered by Adobe Flash. How can you possibly succeed? Wikipedia is an enormous community. How can you go head-to-head with Wikipedia, now a veritable goliath? The solid interest and growth of our project demonstrates that there are many people who love the vibrancy and basic concept of Wikipedia, but who believe it needs to be governed under more sensible rules, and with a special place for experts. We hope they will join the Citizendium effort. We obviously have a long way to go, but we just started. Give us a few years; Wikipedia has had a rather large head start. Three and a half years later it seems clear that in the battle between the online encyclopedia “governed under more sensible rules, and with a special place for experts” has been unable to compete with the “vibrancy and basic concept of Wikipedia“. I’m pleased that Steve Wheeler’s link to Larry Sanger’s blog post helped me to remember my initial curiosity regarding the more managed approach to gathering experts’ knowledge provided by Citizendium and demonstrated the failings in such an approach. Let’s continue making Wikipedia even better is my call for 2012. One of the sessions I attended at the SOLO (Science Online London) 2011 event held in London last week addressed the role of ‘microattributions’ in science (note that there isn’t a specific page on the SOLO11 Web site which I can link to so I have created a Lanyrd page about the Microattributions breakout session). The session began with Mike Peel (@Mike_Peel) showing how contributions to Wikipedia provided an example of a service which supports microattributions. Looking at an example which I am familiar with, a year ago in a post entitled How Can We Assess the Impact and ROI of Contributions to Wikipedia? I commented on the potential value of entries in Wikipedia with the example of Andy Powell’s update to the HTTP_303 entry. This entry has been viewed no fewer that 5,032 times in the past 30 days which I think illustrates Wikipedia’s strengths in providing outreach. However I hadn’t been aware that it was possible to view details of the contributions made to Wikipedia articles. Looking at the list of contributors for the HTTP_303 entry I find that Andy Powell is the top contributor, having made 7 updates – between 09.53 and 10:13 on 24 September 2010. Looking at a more significant article, such as the Wikipedia entry for World Wide Web, we can see that the top contributor, Susan Lesch, has made 253 edits between March 2008 and July 2011. The next most prolific contributor, NigelJ, has made 127 updates followed by the Cluebot bot, which has made 70 automated updates (fixing vandalised updates to the article). Mike Peel illustrated the importance of being able to identify significant contributors to Wikipedia in a story of Professor Gets Tenure With The Help Of His Wikipedia Contributions. The Wikimedia blog provided further information on the contributions which Professor Michel Aaij had made: “more than 60,000 edits, a couple of Good Articles, a Featured List, almost 150 Did You Knows“. Microattribution ascribes a small scholarly contribution to a particular author. and went on to describe how a paper published in March 2011 in Nature Genetics (Systematic documentation and analysis of human genetic variation in hemoglobinopathies using the microattribution approach) concluded that “microattribution demonstrably increased the reporting of human variants, leading to a comprehensive online resource for systematically describing human genetic variation“. During the Microattributions session we heard of several other examples of microattritibutions including contributions to source code on software repositories such as Github. During the session Mike Peel updated his personal page on Wikipedia with some of the ideas which were discussed. On the page Mike pointed out that there wasn’t a Wikipedia entry on Microattributions and invited volunteers to create a page. I responded to this challenge and created the initial stub entry for the article, as illustrated. In my initial draft which, following the suggestion provided by the article creation wizard, I created in my personal Wikipedia space, I included the other examples of microattributions which I mentioned above. However since I wasn’t aware of any significant publication which had documented use of the term in these contexts I defined microattributions in the context of its use in the Nature Genetics paper. I don’t know if the Microattributions will remain in Wikipedia. It might be deemed to be not sufficiently note-worthy. Or perhaps it could be included in some other entry: what, for example is the relationship between a microattribution and a nanopublication – a term coined, I think, by Barend Mons. However I am convinced of the importance of Wikipedia for defining scientific and technical terms and documenting significant issues related to their origin and use. Should funders, such as Research Councils and JISC, encourage funded projects to make use of Wikipedia as a dissemination channel which can help to enhance the impact of funded work? If this does happen there will be a need to understand best practices for creating and maintaining sustainable items in Wikipedia, including concepts such as NPOV. How Can We Assess the Impact and ROI of Contributions to Wikipedia? 303 See Other is one way of responding to a request for a URI that identifies a real-world object according to Semantic Web practice (the other being the use of hash URIs). The contribution Andy had made was to the Wikipedia entry for the HTTP 303 status code. Andy’s contribution to this brief entry was to add a “note about Semantic Web usage of 303 response to indicate real-world object being identified”. My comment to Andy was based on the usage statistics for this entry – in August 2010 there had been 3,515 views of the page and over the past year there have been a total of 35,489 views as illustrated. The HTTP response status code 303 See Other is the correct manner in which to redirect web applications to a new URI, particularly after an HTTP POST has been performed. This response indicates that the correct response can be found under a different URI and should be retrieved using a GET method. The specified URI is not a substitute reference for the original resource. This status code should be used with the location header. The addition makes it clear that the HTTP status code has an important role to play in Semantic Web usage – something that wasn’t mentioned in the original version. So if there are a further 35,000+ views in the next 12 months they may benefit from this additional information. And although there are much more detailed articles about use of the HTTP 303 status code in this context, such as “How to Publish Linked Data on the Web” the addition to the Wikipedia article has the advantage of brevity and the little effort needed to add the sentence. 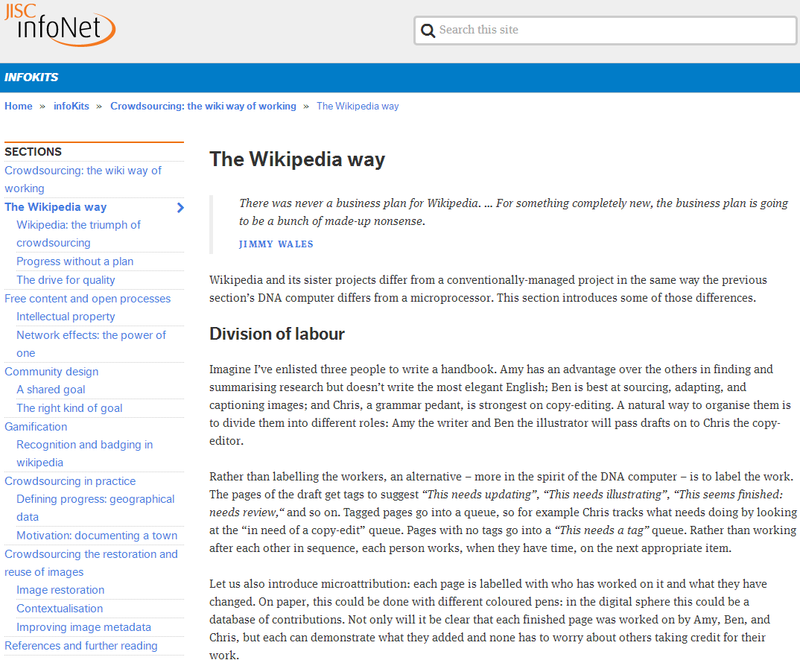 In a recent post on Having An Impact Through Wikipedia I suggested that it would be useful if JISC-funded project work used Wikipedia as a means of disseminating their knowledge and went on to provide examples of how well-read technical articles in Wikipedia can be. But how would we assess the impact of such work and identify the return on investment? In the case of the HTTP 303 article it appears that Andy created the first version of his update at 09.52 on Friday 26 September with the final version being published at 10.13. This suggests that the update took about 20 minutes to produce – although it should be noted that Andy pointed out that he “contribute[s] to wikipedia so rarely, it always takes me ages when i do“. So can we speculate that 20 minutes work may provide a significant part of an article which will be read by over 35,000 people, based on current trends? And how does this compare with other ways in which 20 minutes of work? Is a blog post likely to have a similar number of readers? I can’t help but feel that contributions to Wikipedia (by which I mean ‘sticky’ contributions which are not removed) may have a more significant contribution in certain areas that many other dissemination channels. Unfortunately there doesn’t seem to be any incentives for such contributions to be made apart from the ‘Big Society’ approach of doing good on a voluntary basis in order to provide benefits to others. This approach, I feel, won’t scale. So shouldn’t we encourage contributions to Wikipedia as a dissemination activity which should be formally recognised? My question, therefore. is should JISC programme managers encourage projects to contribute to Wikipedia and encourage the projects to report on successes they have doing this? And if you want an example of the outreach which can be gained through use of Wikipedia have a look at the August 2010 usage statistics for the Scientology article (158,845 visits in the month) – an article which Martin Poulter (a well-established contributor to Wikipedia who is ICT Manager at the ILRT, University of Bristol) has contributed to. How Well-Read Are Technical Wikipedia Articles? In a recent post on Having An Impact Through Wikipedia I suggested that it would be useful if JISC-funded synthesis reports, for example reports on emerging new standards, used Wikipedia as a means of enhancing access to such work. In the post I pointed out that “I can’t find usage statistics for the page [but] I suspect that the article [on Amplified Conference which I created] will have been read my more people than have read my various peer-reviewed papers, blog posts, etc.” In response to a request for examples of tools which provide usage statistics for Wikipedia articles Martin Greaney suggested that “It’s quite basic, but the tool at http://stats.grok.se/ might give you enough of an idea of the traffic to certain articles in Wikipedia“. As Lorcan Dempsey suggested in a tweet “The Wikipedia article traffic stats site mentioned in your comments is quite interesting. wonder how reliable is“. I agree and thought I would explore what the statistics tell us about Wikipedia entries for a number of areas related to Web, metadata and related standards of interest to the JISC development community. My survey was carried out on 6 July 2010. 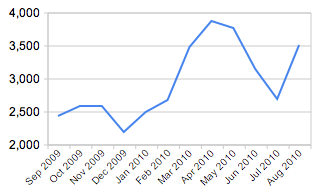 The following table provides a link to the relevant Wikipedia article, the data the article was created (with a link to the original page for the article), my comments on the article and the usage statistics for October 2009 and June 2010 (two dates chosen to observe any significant variations). Extrapolating from the usage statistics for the two dates it would seem that popular articles such as HTML and XML have an annual number of views of around 1,750,000 and 1,720,000 whilst an article on a less well-known standard such as METS has an annual number of views of around 70,0000. It is perhaps surprising, in light of the high viewing figures for METS that the annual viewing figures for MODS is around 6,700. Perhaps this is due to the name clash between the METS acronym and the Mets name used to refer to the New York Mets. However there isn’t, as far as I am aware, such scope for confusion with names such as HTML, XML, SAML, etc. What conclusion might we draw from such statistics? I would suggest that if I had an interest in ensuring that users had a good understanding of what Dublin Core is about and had access to the key sources of information then contributing to the Dublin Core Wikipedia page would be a good way of achieving that goal – after all the estimated viewing figures of around 87,000 surely can’t be ignored. Can we accept that the answer to the second question should be ‘Yes‘ so that we can explore ways of addressing the first question? A recent tweet from Miquel Duran (a University professor, researcher in quantum chemistry, fostering communication of science 2.0 and university 2.0) alerted me to a blog post on The ‘Amplified Conference’. Amplification of the learning: With the Web resources and social media technologies, following links to resources and discourse about the points made by a speaker during a talk propagates the learning which takes place at an event. I then thought that the words sounded familiar and, on rereading the Amplified Conference page on Wikipedia, I realised that I was reading words I had coined when I created the Wikipedia page in on 30 August 2008! Amplification of feedback to the speaker: Micro-blogging technologies, such as Twitter, are being used not only as a discussion channel for conference participants but also as a way of providing real-time feedback to a speaker during a talk. We are also now seeing dedicated microblogging technologies, such as Coveritlive and Scribblelive, being developed which aim to provide more sophisticated ‘back channels’ for use at conferences. Amplification of a conference’s collective memory: The popularity of digital cameras and the photographic capabilities of many mobile phones is leading to many photographs being taken at conferences. With such photographs often being uploaded to popular photographic sharing services, such as Flickr, and such collections being made more easy to discovered through agreed use of tags, we are seeing amplification of the memories of an event though the sharing of such resources. The ability of such photographic resources to be ‘mashed up’ with, say, accompanying music, can similarly help to enrich such collective experiences. The Suite101.com article had nicely summarised. It was perhaps surprising that the article hadn’t provided a link to the Wikipedia article which, I would assume, was a source resource – but this isn’t something which particularly concerns me. Indeed I did wonder that if Suite101.com has a policy that one shouldn’t cite Wikipedia entries (as may be the case in higher education) whether the author would be in a position to cite the resource? I have to admit that when I wrote the article I only cited Lorcan Dempsey’s original (brief) blog post and an article published by Paul Shabajee in the Times Higher Educational Supplement – the main body of the text was content I created in Wikipedia and had not published elsewhere (which perhaps I shouldn’t have done?). I have previously suggested that Wikipedia should be used more widely across the higher education sector. Shouldn’t, where appropriate, the outputs of JISC-funded reports be included in Wikipedia articles? As an example consider the JISC-funded report on MODS: Metadata Object Description Schema [PDF]. This report, written in 2003, was commissioned by the JISC and is now hidden on the JISC Web site. meanwhile there is a brief entry on MODS in Wikipedia which, I would have thought, would have benefitted if the information provided if the JISC report had been included. The JISC report does state that the copyright is held by JISC. This is a barrier to providing content in Wikipedia, which must be made available under a Creative Commons licence. But as JISC seek to be proactive in encouraging take-up of their deliverables under open access licences, I suspect this is not a fundamental barrier on allowing such content to be made available in a popular environment such as Wikipedia. And with the growing interest in DBpedia (the Linked Data representation of Info boxes in Wikipedia entries) providing content in Wikipedia may also allow such content to be integrated in Linked Data applications. Whilst I feel it would be inappropriate to mandate that the content of reports commissioned through public funding should be made available on Wikipedia, I do feel that this should be encouraged. What’s your view? I recently noticed a referrer link to this blog coming from the Answers.com Web site. I’ve not visited this site before so I thought I’d visit and use the service to find an answer to a question. The question I thought I’d ask was “What is JISC?” And, as shown below, I found that “The Joint Information Systems Committee (JISC) supports United Kingdom post-16 and higher education and research by providing leadership in the use of ICT (Information and Communications Technology) in support of learning, teaching, research and administration. JISC is funded by all the UK post-16 and higher education funding councils.“. This answer is taken from the JISC entry in Wikipedia. Similar results are found by asking questions such as “What is UKOLN?” and “What is Bath University?” as well as for more general questions such as “What is research” although for questions such as “What is education?” the answers are drawn from a variety of sources, with the Wikipedia definition to be found after results from sources such as The American Heritage Dictionary, Roget’s II: The New Thesaurus, Third Edition and the Britannica Concise Encyclopedia. What are the implications of this? The first, unsurprisingly, is that if information about your organisation or your areas of interest are available in Wikipedia, then the Creative Commons licence which is assigned to the material will help to ensure that this information is surfaced in multiple locations. And perhaps more subtly, if you don’t use Wikiepdia, or you require that your students don’t use Wikipedia, you may find that you are inadvertently using information held by Wikipedia and made available via others services such as Wikipedia. In the search for JISC the top entry was clearly labelled as coming from Wikipedia, but in the example of “What is education?” the first set of references came from more traditional sources of information, and if you scroll down you may miss the citation details for the entry from Wikipedia. A post on Mind maps & Wiki on the 2coach blog introduced me to the Wikimindmap tool. This provides a visualisation of information provided on Wikipedia. And a post on the Web2learning.net blog illustrates how a search for “Library” is displayed, but I was more interested in searching for my hobby in the analogue world – “rapper sword”. Although text on the home page implies that the service may not be sustainable (“Due to high request, WikiMindMap will soon be available as intranet solution. Please come back here to keep you informed.“) I was more interested in this service as an example of how making your data available for reuse by others (content in Wikipedia has a Creative Commons licence) and providing access to the data can allow applications to be developed which the original developed may not have considered. My colleague Paul Walk mentioned this recently in a post on “The coolest thing to do with your data will be thought of by someone else“. Is this interface of use? Perhaps it may be considered somewhat gimmicky – but I do wonder if this type of graphical interface to an encyclopedia might provide accessibility benefits? Wikipedia – Can We Provide Open Access For Training Materials? Melissa Knighton, who works on the Staff Development Unit at the University of Leeds, and I took part in a workshop at ITCP held in Trieste a couple of years ago. So I was interested to rediscover her Elgg blog recently. Her posting on Wikipedia – a resource for learning and teaching? 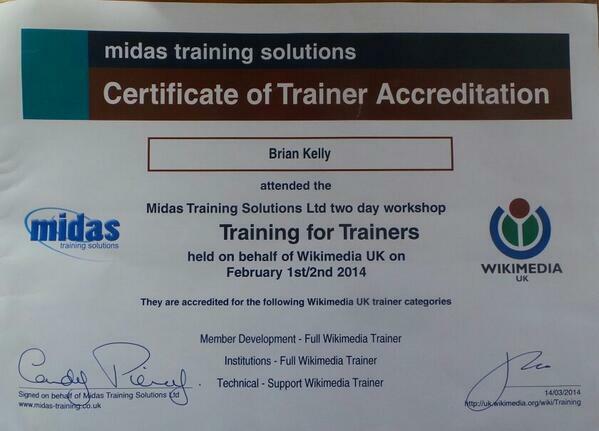 described a staff development course on the role of Wikipedia in learning and teaching. Further exploration of the Elgg blog service at the University of Leeds led me to a posting on Wikipedia: What the critics say by Angela Newton, the Information Literacy Team Leader in the Library at the University of Leeds. Angela’s posting summarises Wikipedia’s strengths and weaknesses – issues which, I’m sure, will be addressed more fully in the staff development course. But how much time and effort will be spent in duplicating the development of similar materials across the library and information sector? The Library sector, in particular, should appreciate the benefits to be gained by providing open access to resource, and such benefits need not be restricted to research publications – Creative Commons licences can also be used with document and training materials. This is an argument I made in a paper on Let’s Free IT Support Materials! which I presented at the EUNIS 2005 conference. Which will be the first Library to provide a Creative Commons licence for its documentation and training materials? And have a Creative Commons logo on slides used in training courses? Or is this already happening?